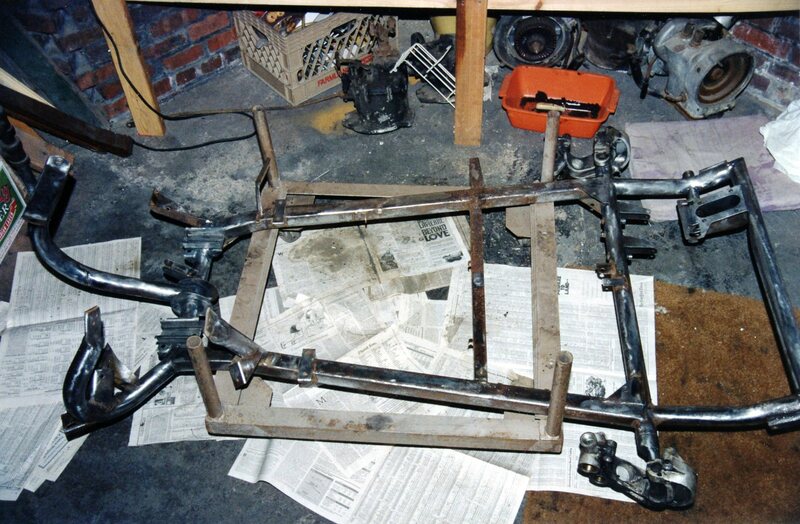 In Chapter 6, we saw in pictures and words how the chassis was the first component to be transformed from rusty hulk to freshly painted beauty (if an Isetta chassis can be beautiful). 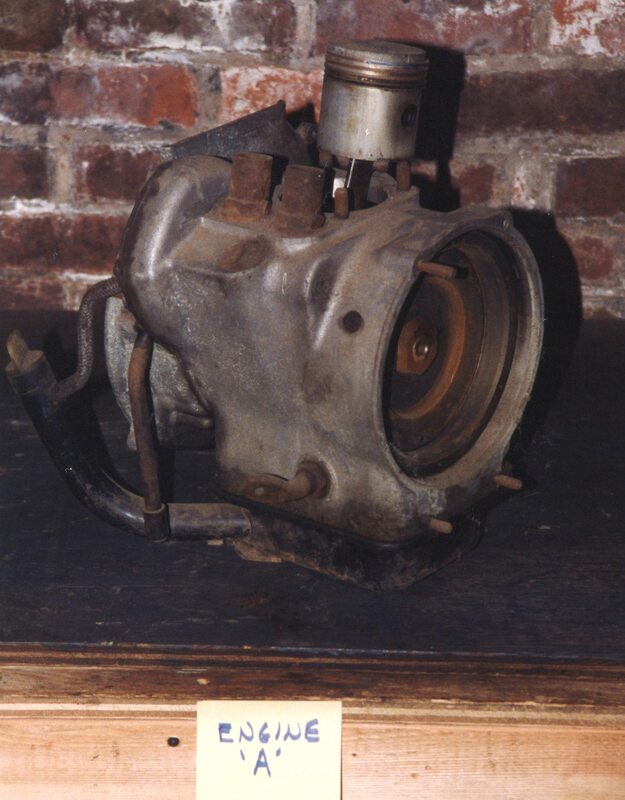 In Chapter 7, we discover the secrets to taking apart what is essentially an air-cooled BMW motorcycle engine. Then we do it two more times. You cannot embark on a project of this magnitude and expect to do it alone. This is especially true for tasks you’re performing for the first time. At some point, there will be the need to rely on, and to seek expertise from, those who have done these things before you. This is the theme for this Chapter, and this concept will certainly be revisited again. 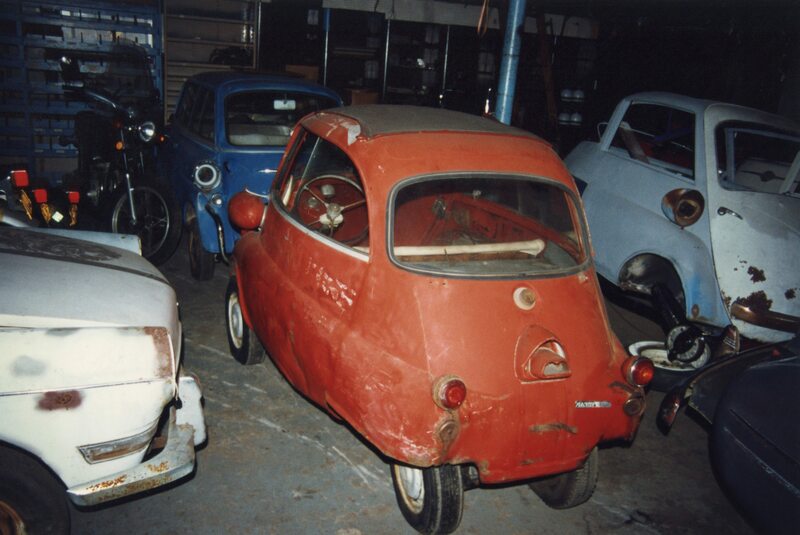 I’ve related in earlier Chapters how glad I was to discover other hobbyists who were Isetta restorers and collectors. 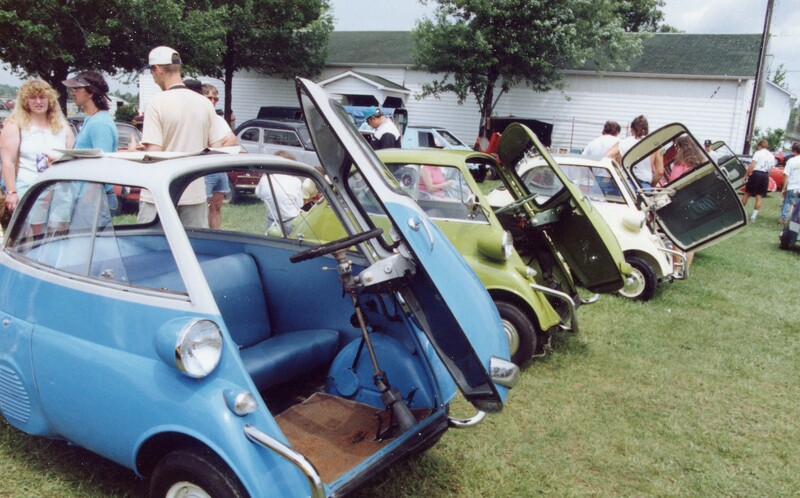 There was some knowledge-sharing, and just as important to me, there was satisfaction in knowing that parts availability could be fulfilled through some of my fellow Isetta fanatics. 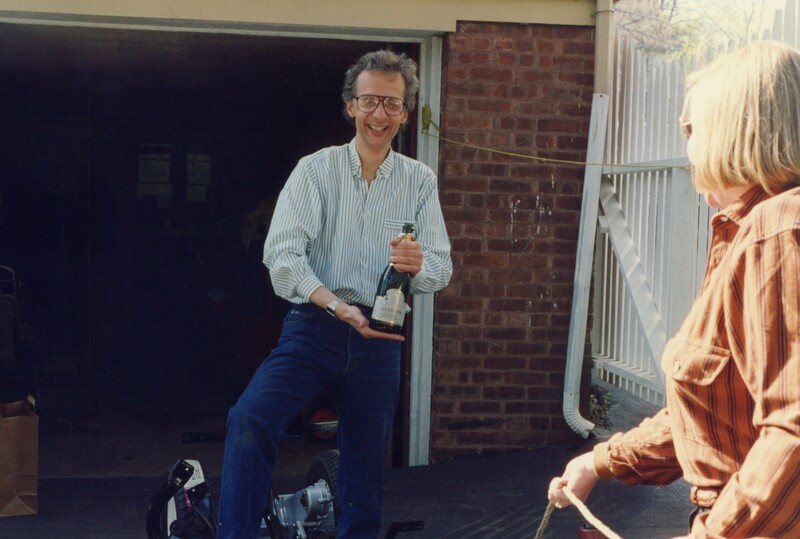 Now, as I was about to start a mechanical teardown and rebuild, I really needed some assistance from others. 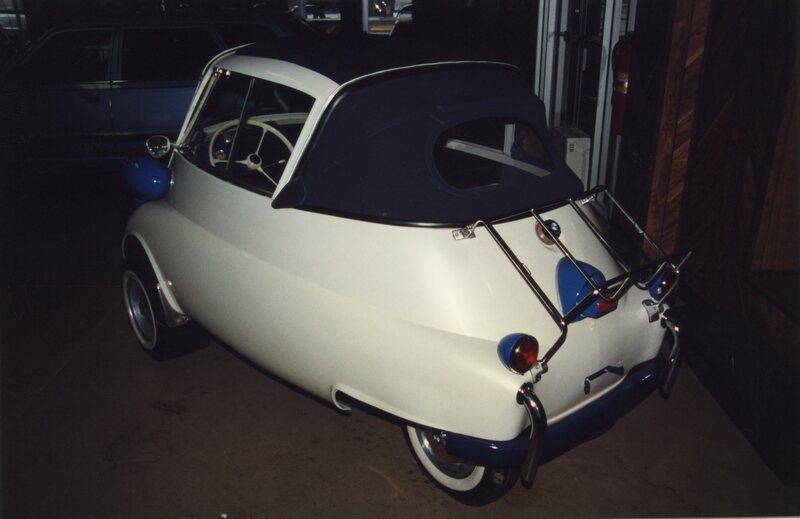 Two gentlemen who were serving the Isetta community, John Jensen and Ron Krause, were both huge factors in the success I had with my engines. 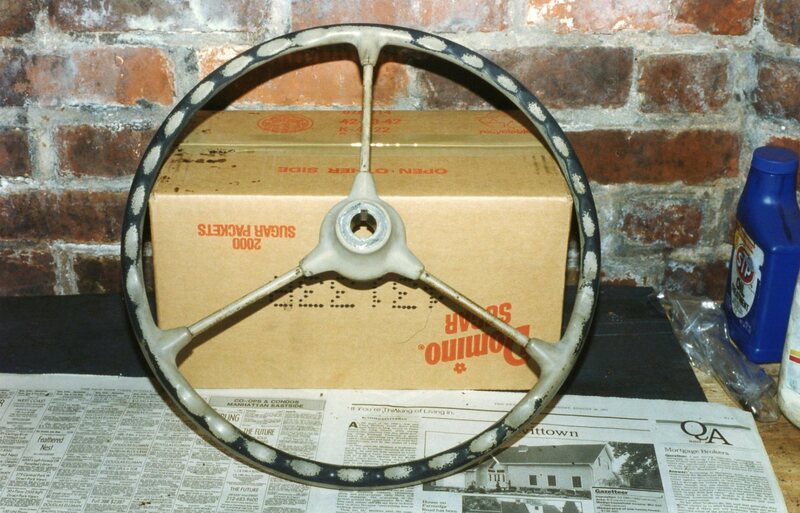 Simply put, this restoration would have faced a far rockier road without them. 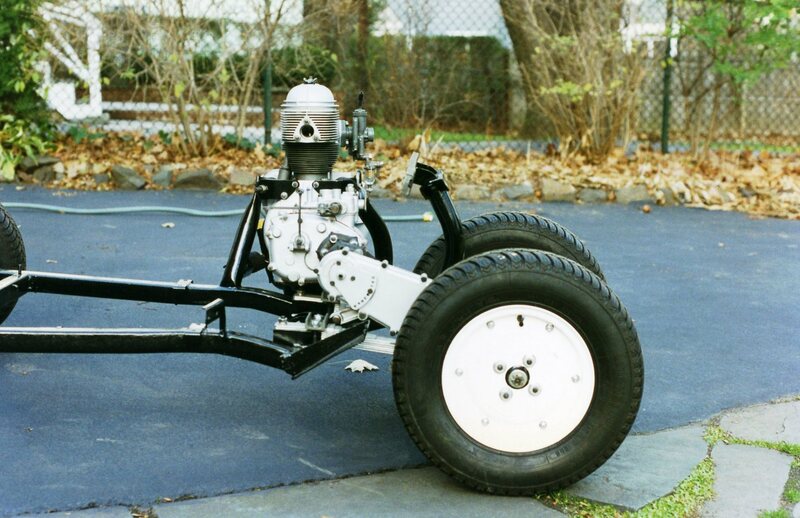 With the cleaning and painting of the bare chassis done, I had to decide which mechanical sub-system to work on next: engine, gearbox, rear axle, electrical, suspension, or brakes. 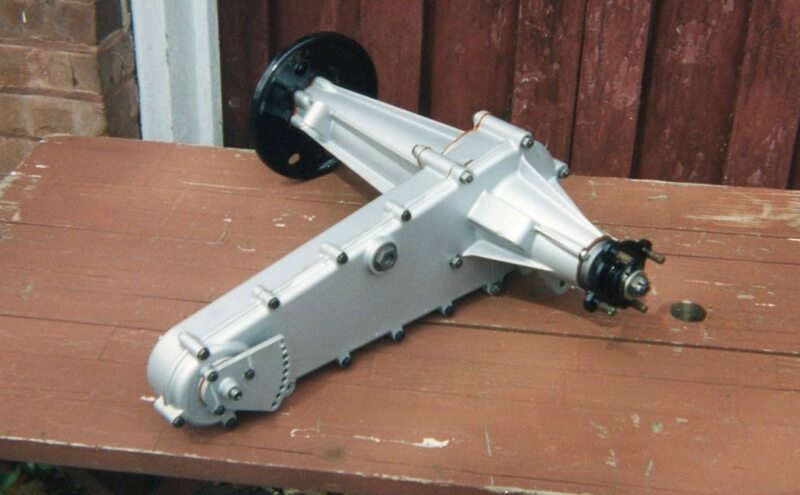 Bodywork, which I would not be doing myself, would be postponed until most or all of the mechanicals were completed. 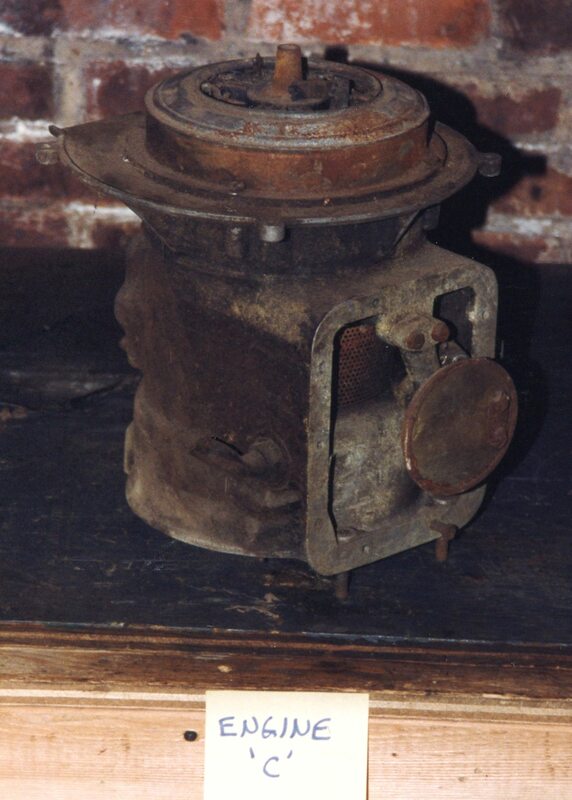 The decision was made to begin with the engine, as that would potentially take the most time. 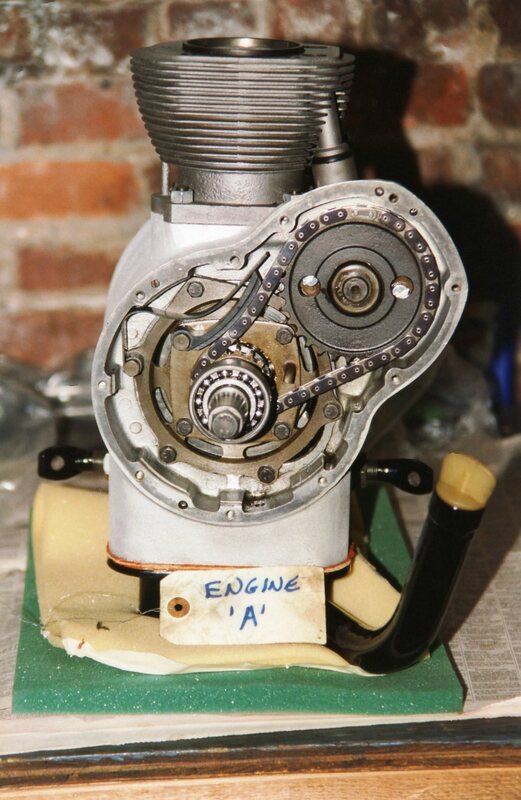 Also, from staring at these engines over the last few years, I still did not know how to take the one-cylinder Isetta engine apart. 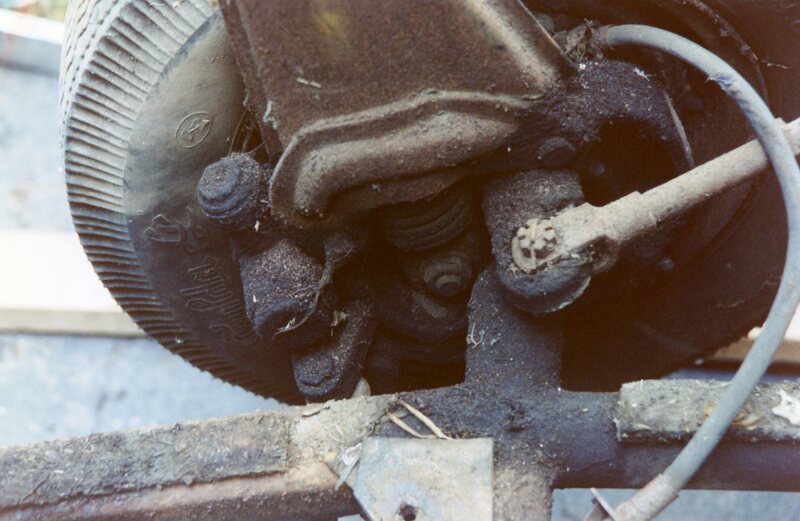 To be specific, I saw no way to remove the crankshaft & connecting rod from the crankcase. 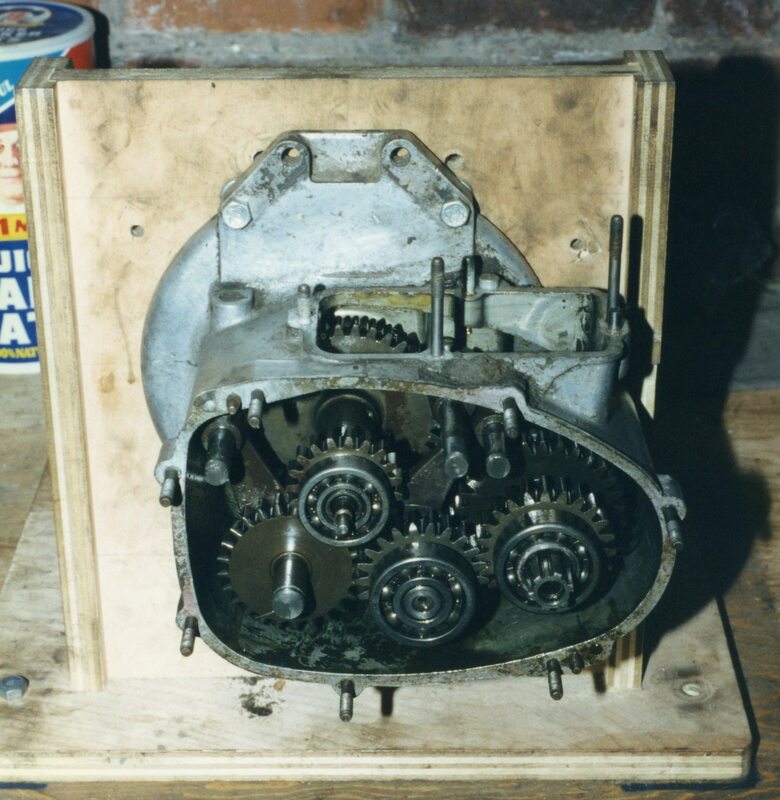 The case was one piece; it was not “split” the way an air-cooled VW or Porsche crankcase is. 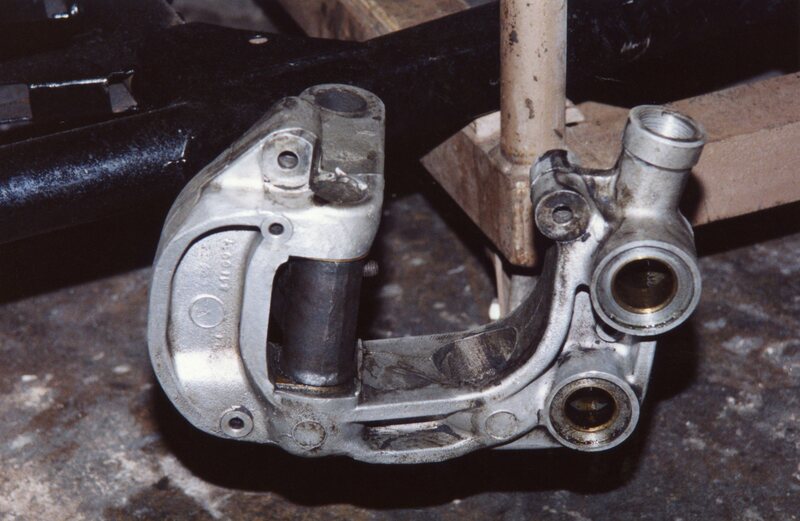 And as near as I could tell, the bottom of the connecting rod was not split either. At least I couldn’t see or feel any bolts which would hold an end cap in place. 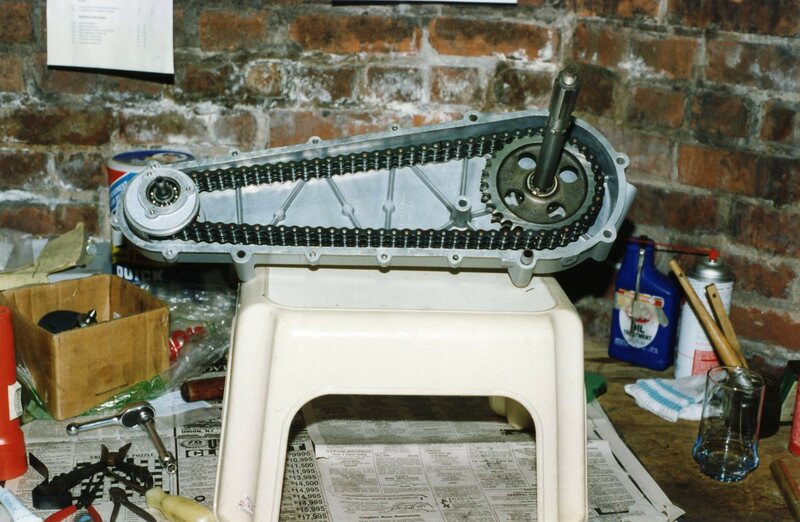 Whatever the trick, this was nothing like any other automotive engine I had worked on. 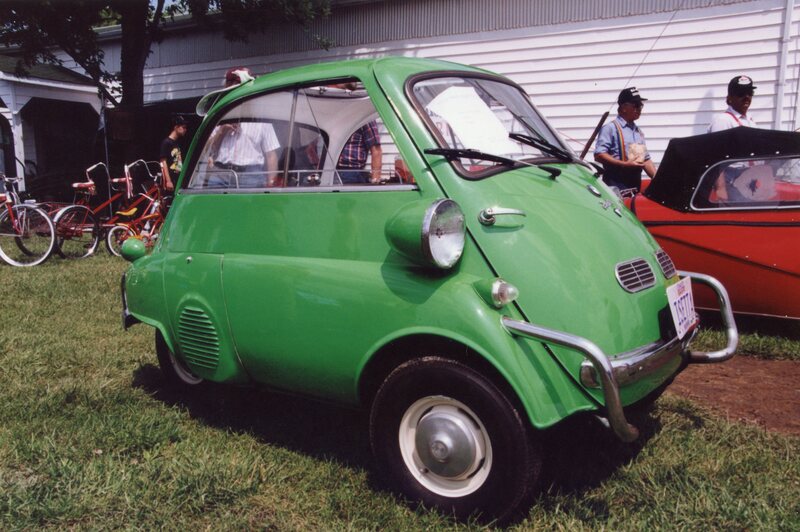 I was now subscribing to Minutia, the quarterly publication of the Microcar & Minicar Club. 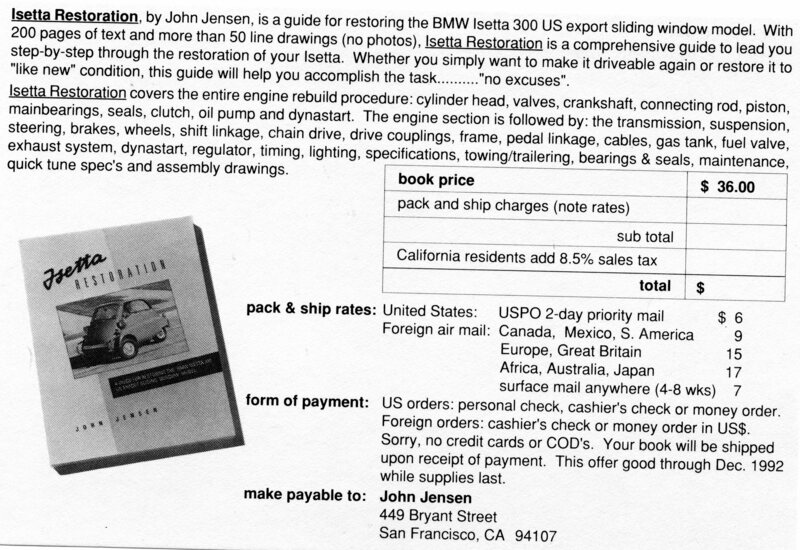 In a recent issue was an ad from a fellow named John Jensen (I recognized his name from the old HMI Club). He was advertising a book he had authored and self-published (come on, you think Random House was interested?) 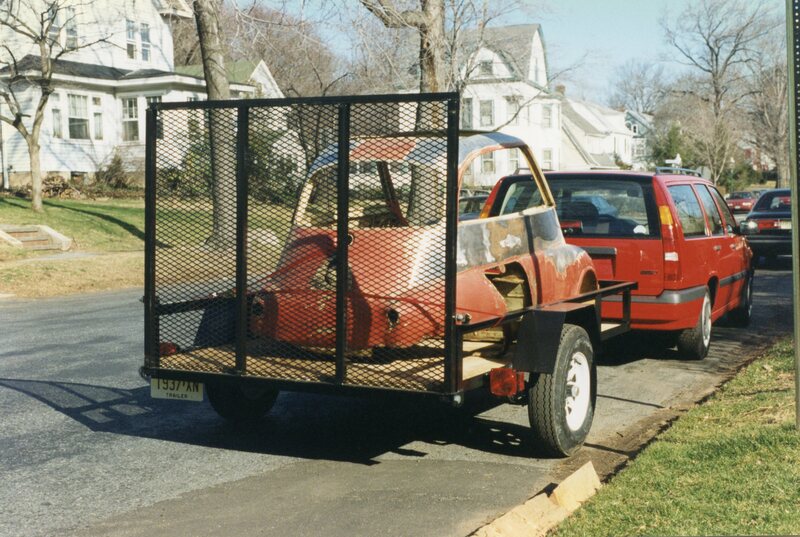 entitled “Isetta Restoration”. 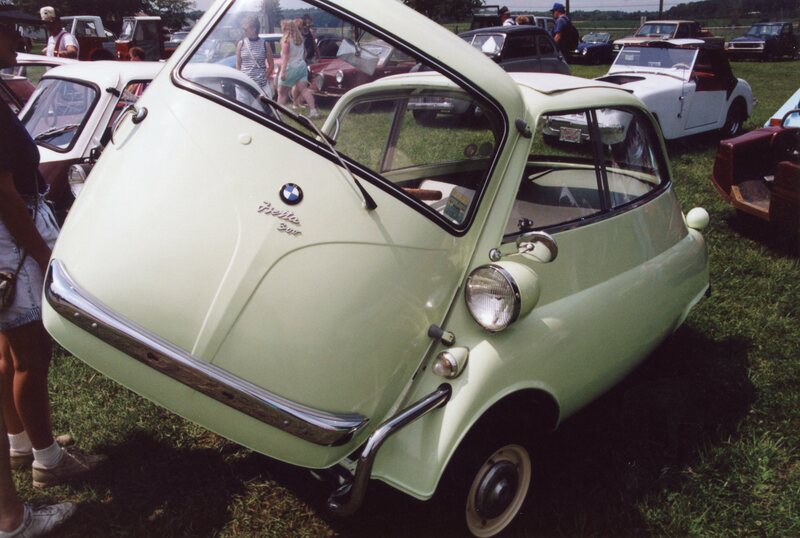 He claimed that the book was a detailed account of the restoration of his own Isetta. 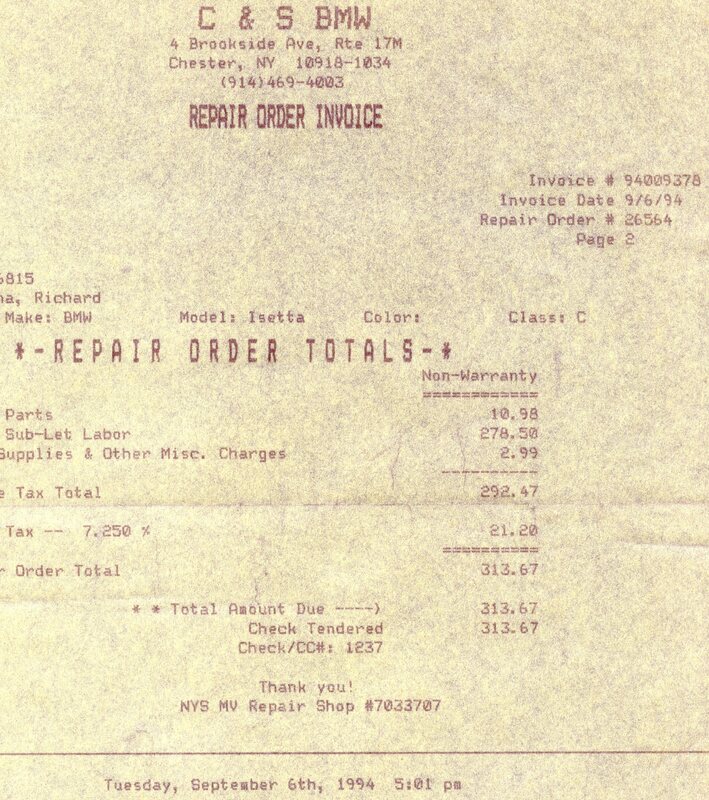 It seemed expensive at $42 in 1992 dollars, but I purchased it. For me, this was as good as “X” marks the spot on a treasure map. I couldn’t wait to try this. 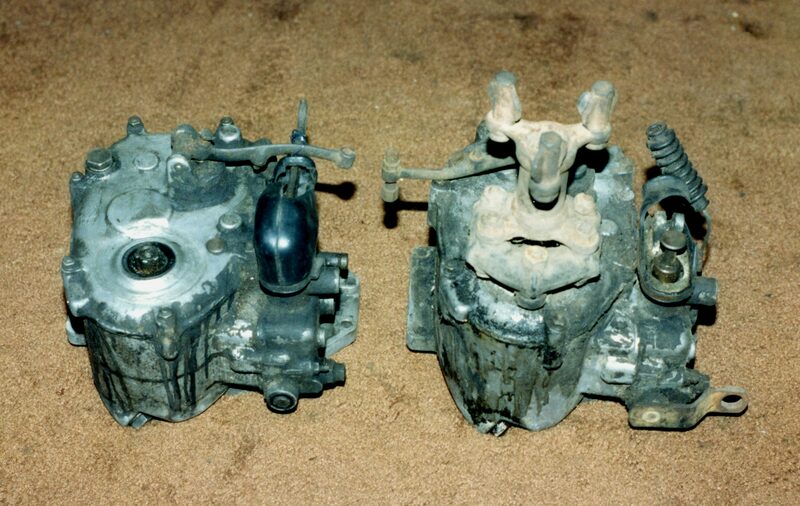 But first I needed to make a decision: WHICH of the three engines would I rebuild? 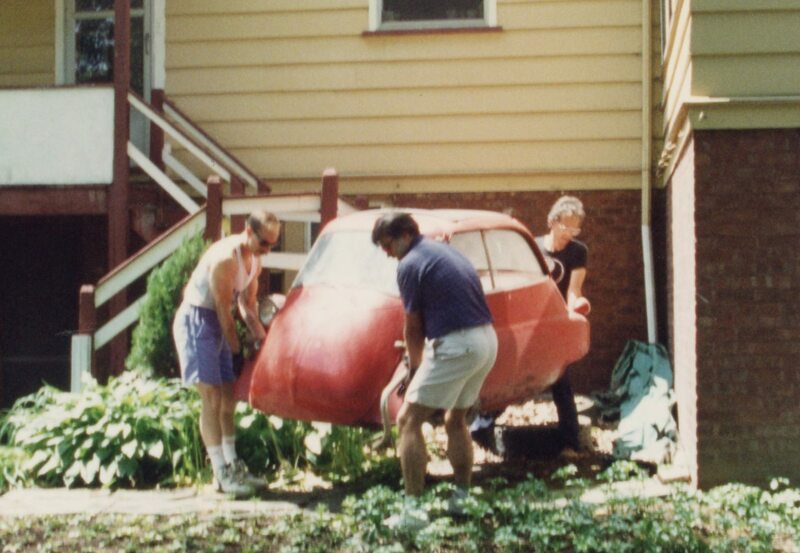 Yes, I was in possession of three engines, all in various states of disassembly. 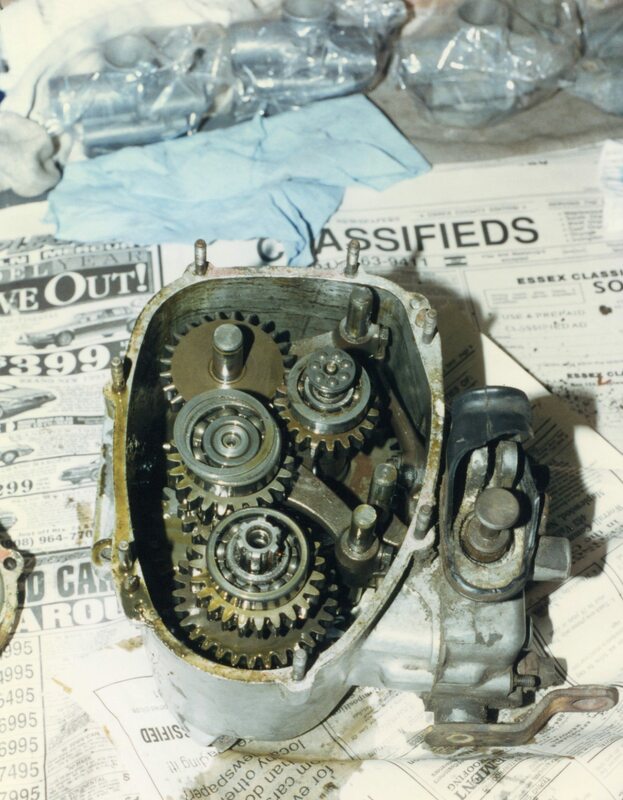 Taking an approach I had already used with the bodies, carburetors, and other systems, I decided to disassemble all three engines, and take stock of what I had. I cleverly labeled the engines A, B, and C. Three cardboard boxes were also labeled A, B, and C, and were positioned under my workbench. 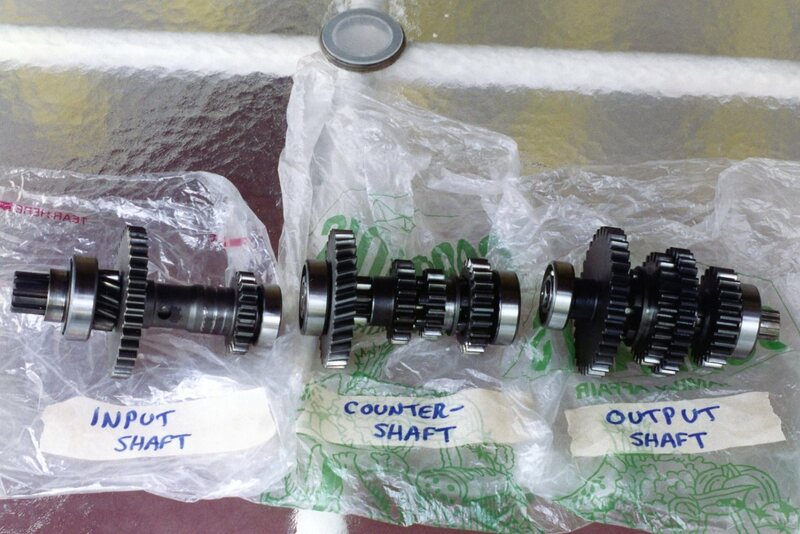 As parts came off, they went into their respective box. 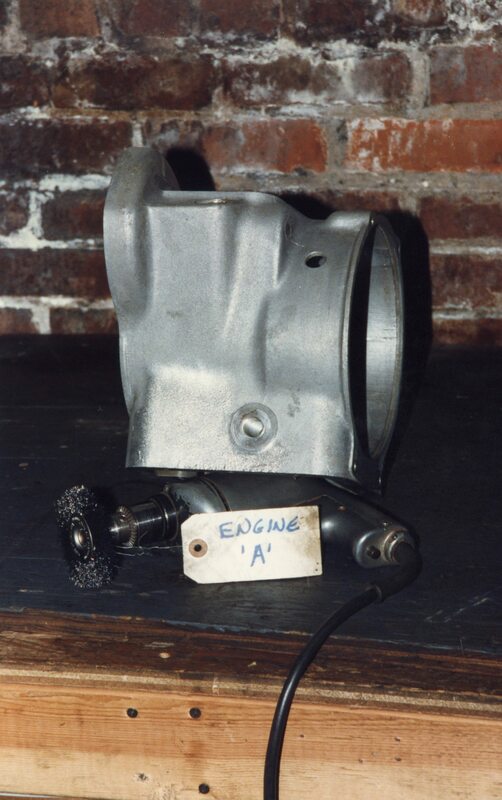 At first glance, all the engines looked questionable, as they had been open to the elements for many years. 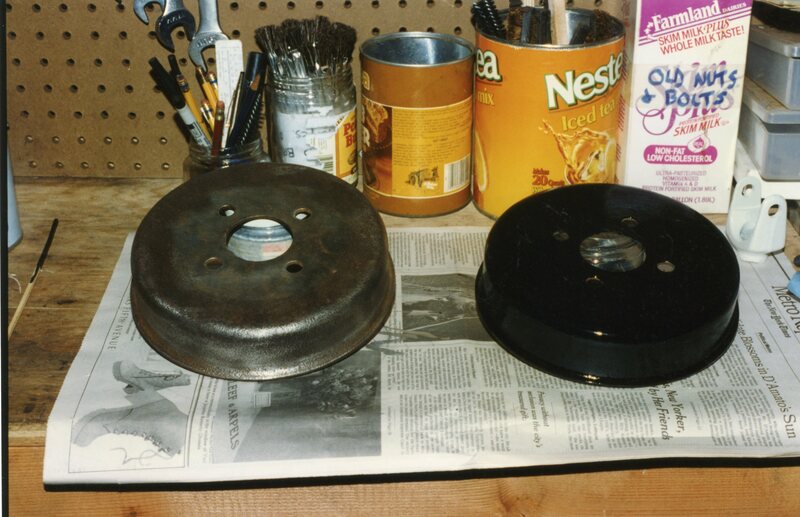 With front covers and oil pans removed, the picture became clearer: the ones which kept oil in them looked better, if a bit black. 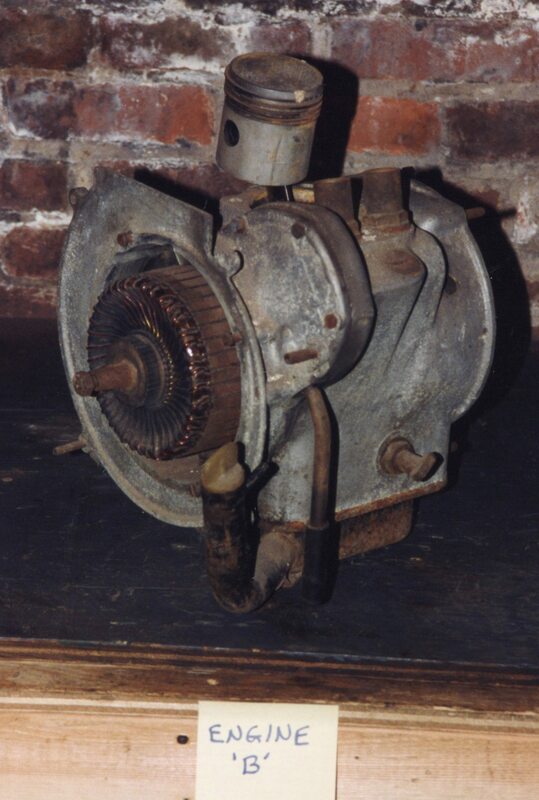 And one looked like it had been lifted from the deck of the Titanic (not really, but it certainly had been in water). 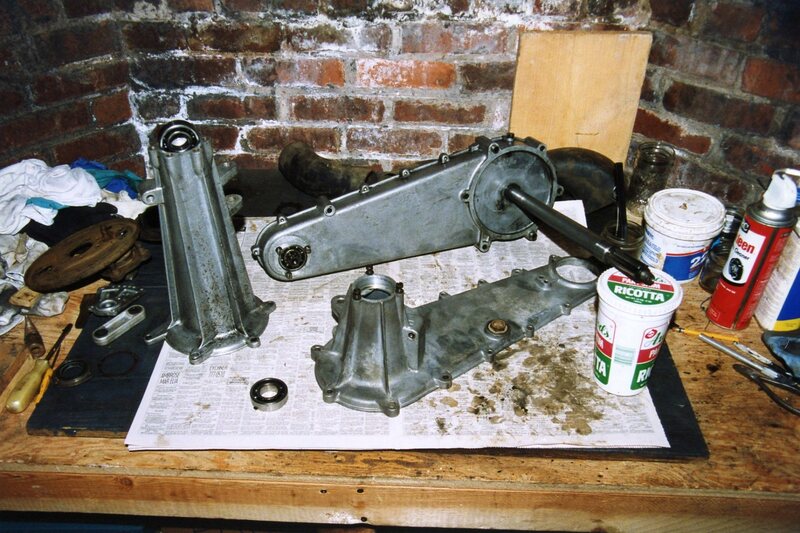 Based on this visual inspection, I decided to rebuild two engines, one for my car, and one for my step-son’s. 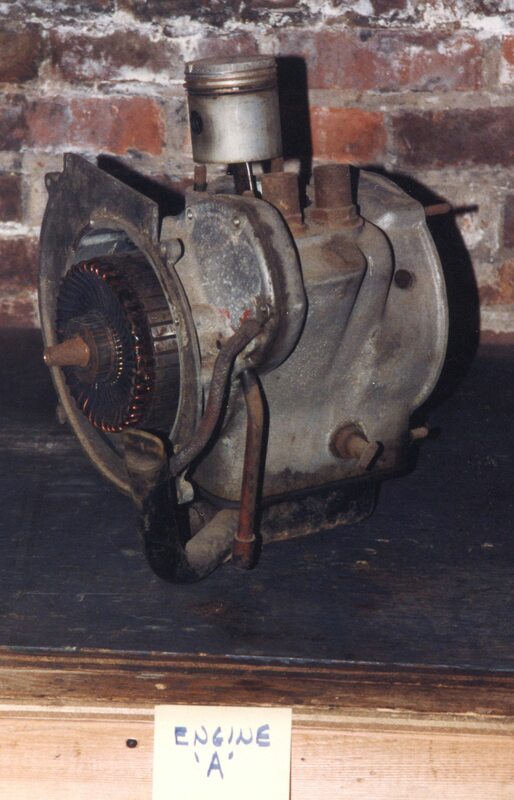 The third engine would be sold for parts, which would help fund the project. 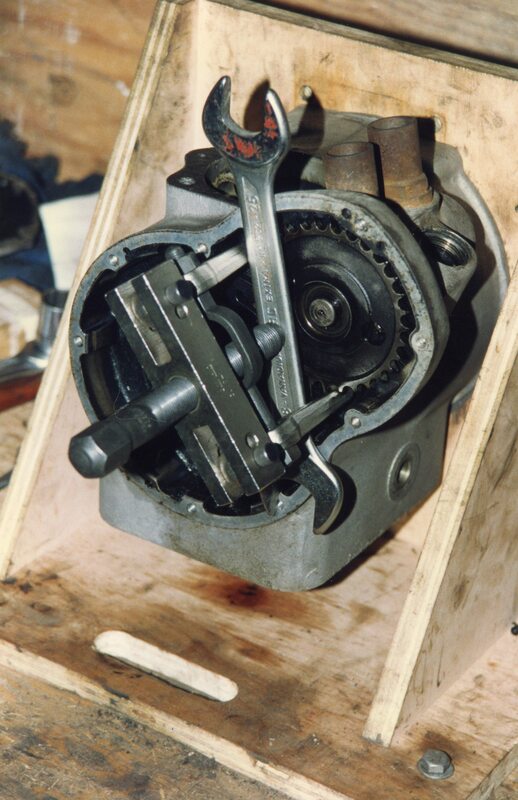 A colleague at Volvo, Steve Kraitz, was also a part-time carpenter, I showed him a page from Jensen’s book which detailed the construction of a wooden engine stand that could be bolted or clamped to a workbench. 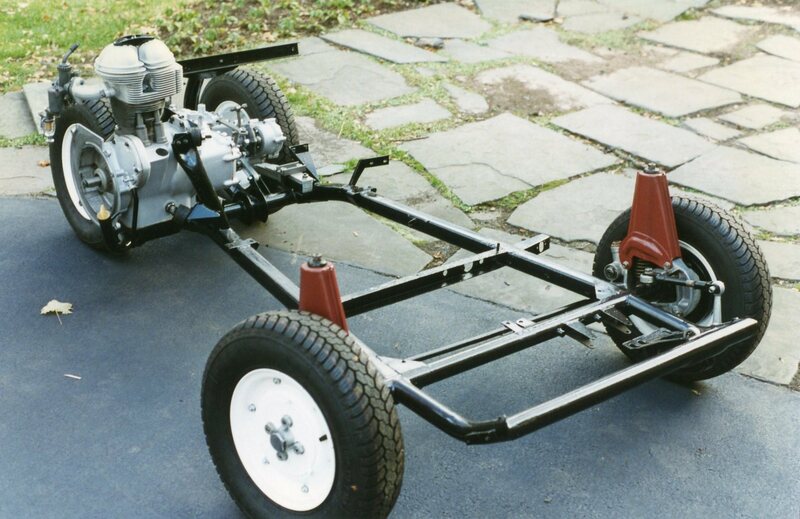 Steve gladly agreed to build this for me, charging only for the cost of the wood. 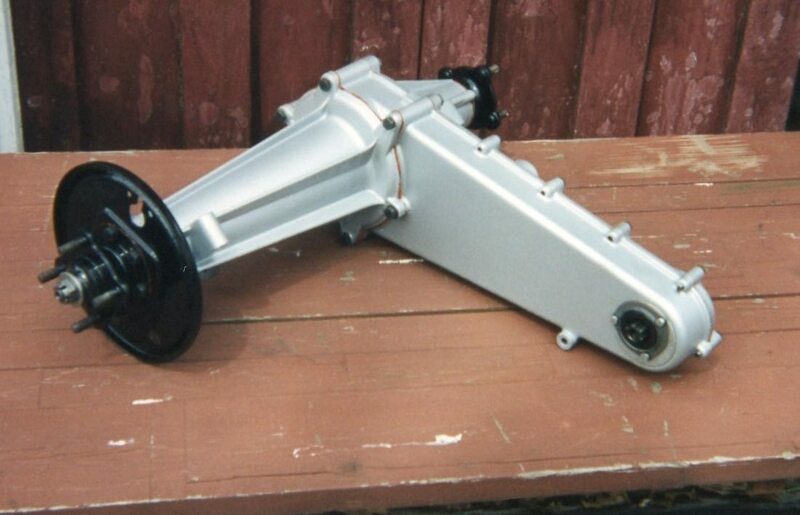 That stand was a major help with the engine rebuilds. 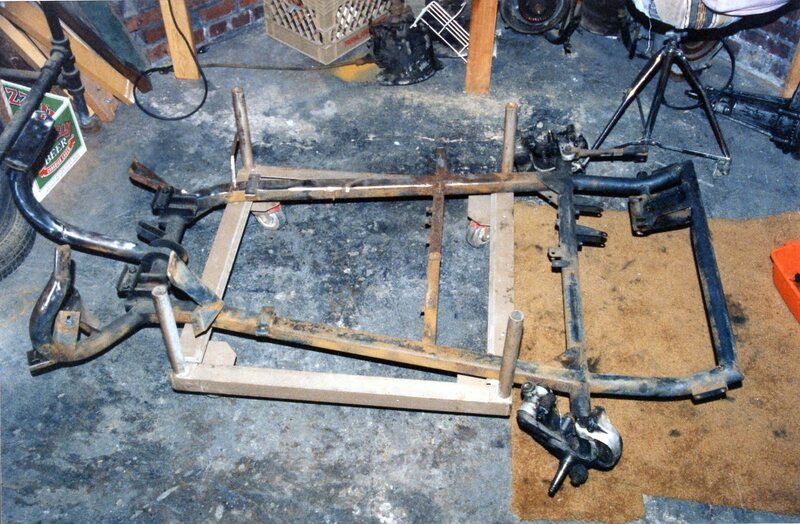 Because the engines are so small, it was a simple matter for one person (me) to bolt the engine to the wooden stand, and then lift and bolt the stand to my workbench. 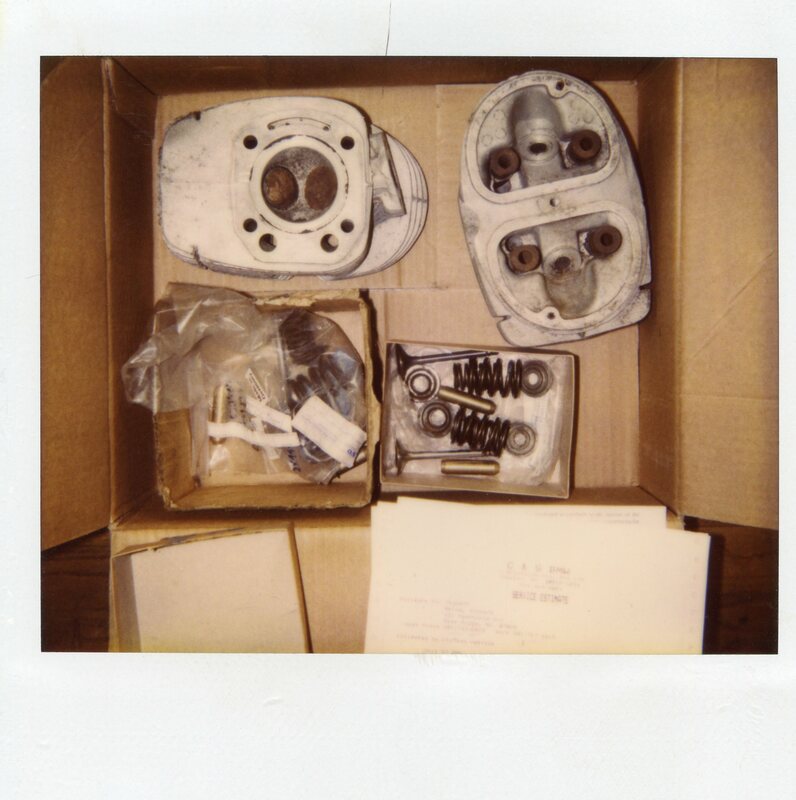 As engine parts were removed, they were cleaned, labeled, and returned to the appropriate box. 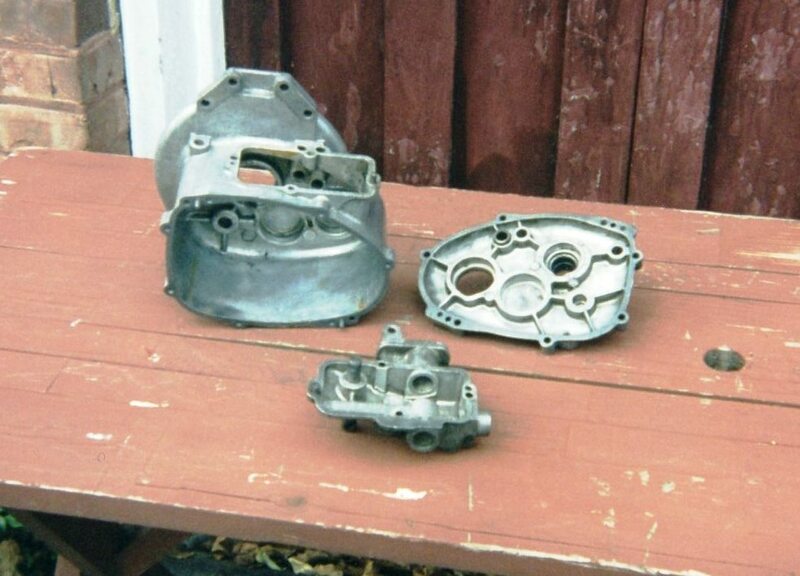 I now had three engine crankcases, with everything removed except crankshafts and connecting rods. Time to fire up the blue torch. My trusty Bernz-o-Matic was pressed into action. 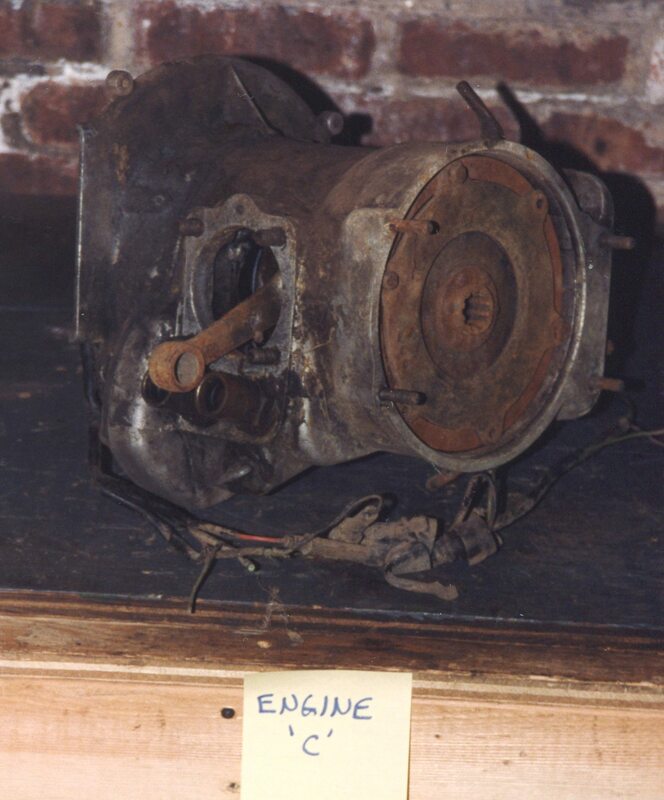 I selected Engine A. 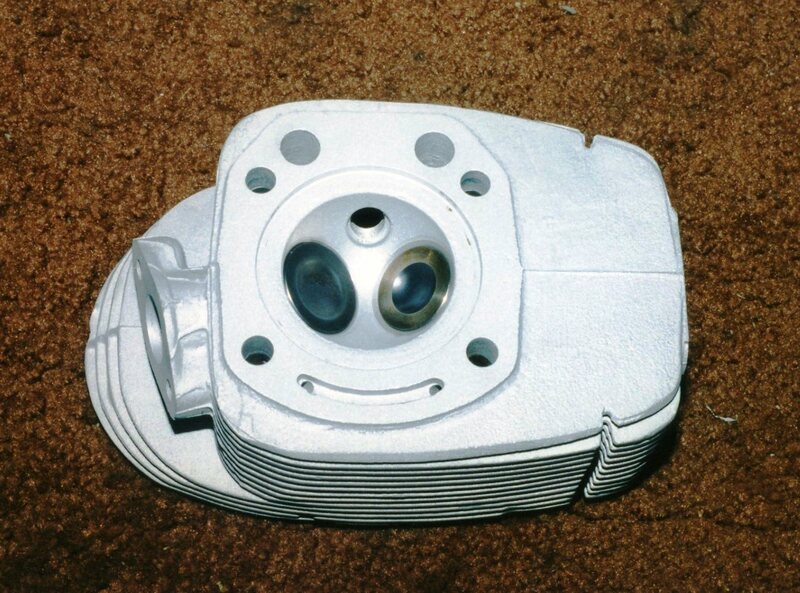 With the exterior of the crankcase as clean as possible (I didn’t need to add to the drama by igniting any errant sludge), I moved the flame around the front of the case. 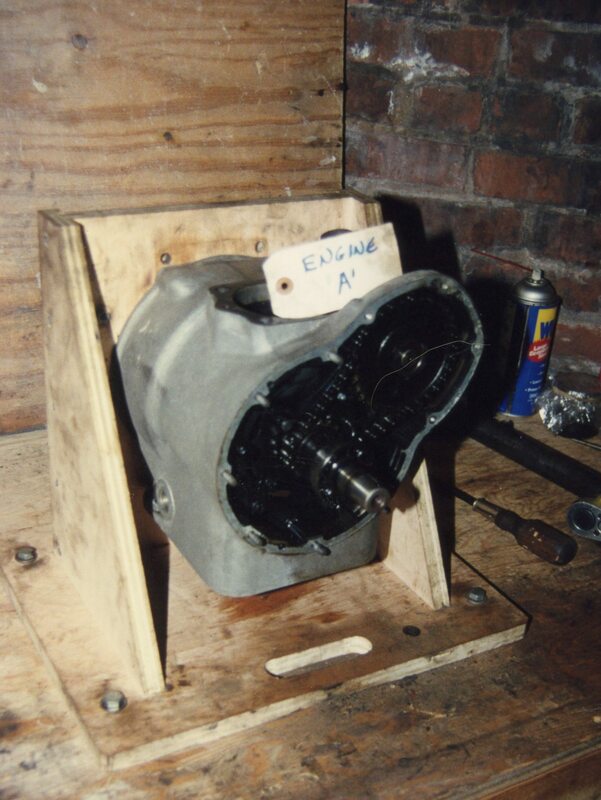 The crankcase, of course, was bolted to the plywood engine stand, so I couldn’t get too close to that either! It felt like an eternity, but after about 15 minutes or so of heating, I guessed that the aluminum had absorbed as much heat from a propane torch as it was going to. 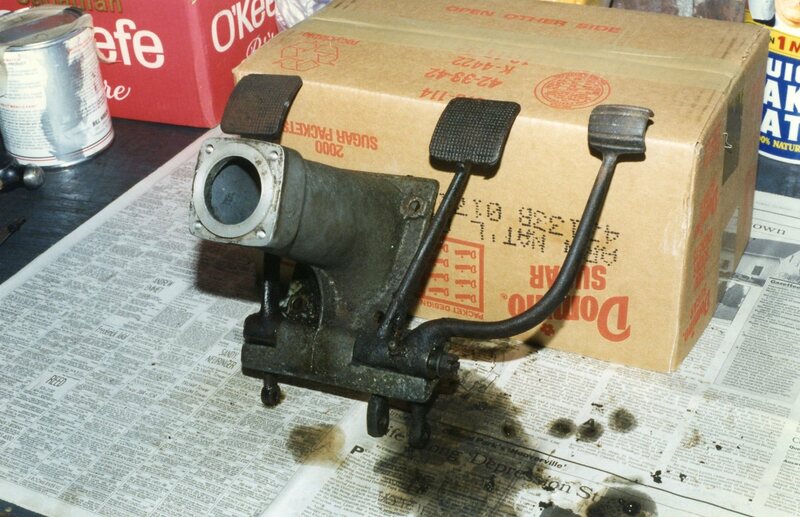 I grabbed the oven mitt which I had thoughtfully brought down from the kitchen, grabbed the nose of the crankshaft, and worked it forward. 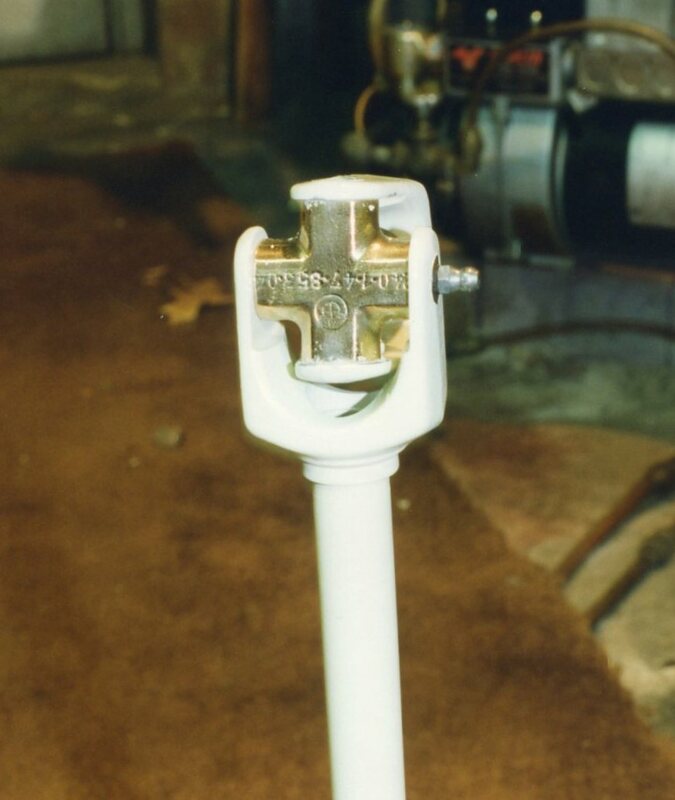 I had to experiment with tilting the shaft to get the connecting rod to clear the opening. It looked like it wasn’t going to come out. Moments passed. 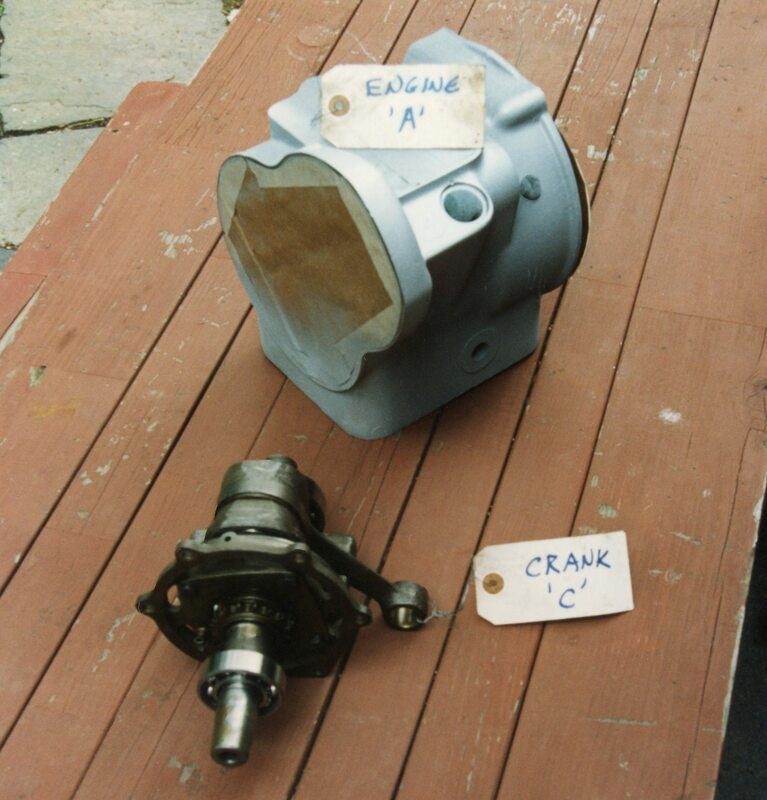 The crankcase was cooling off. 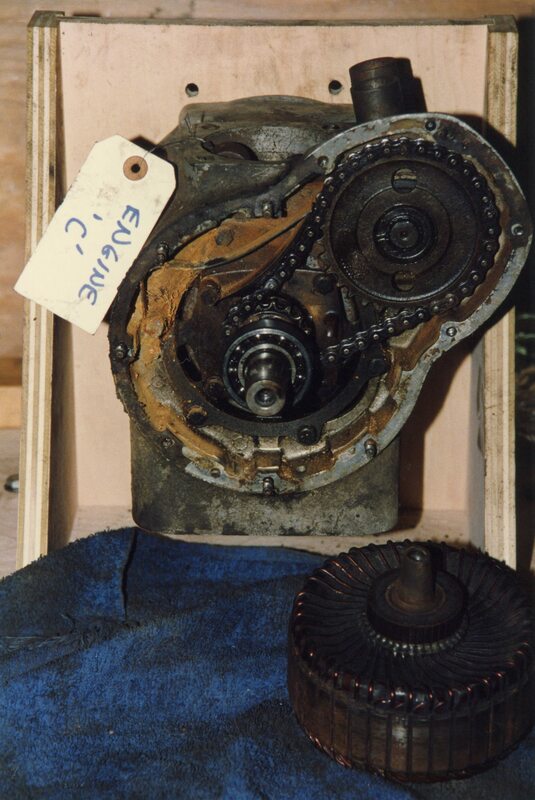 POP – I must have blinked, because in the next moment, I was holding onto a crankshaft/conrod assembly OUTISDE the crankcase. Yahoo! I exclaimed (before that was a search engine). I stopped for now. This was too much excitement for one night. 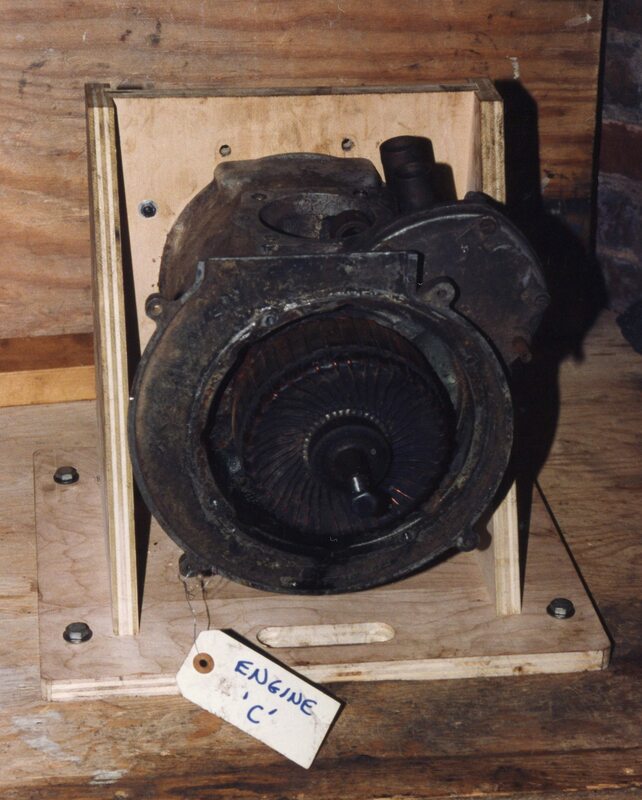 I worked on the next two engines on subsequent nights, with the same success. 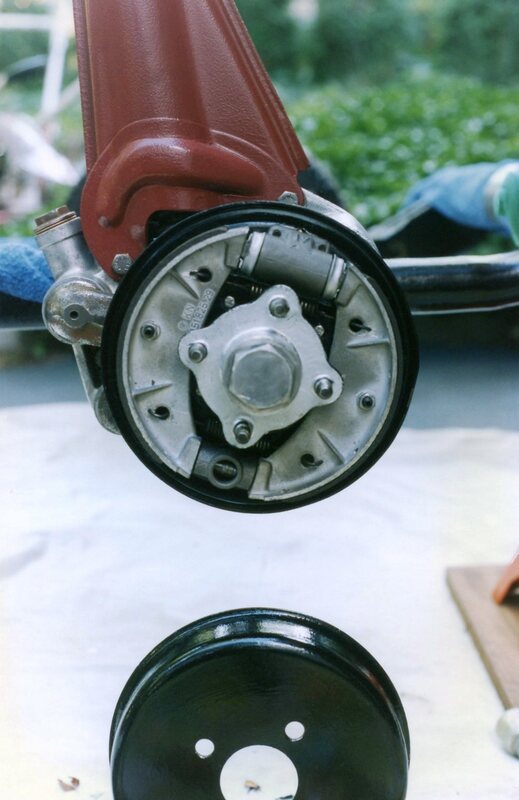 But the next step was still a problem in search of a solution: how was I going to separate the crank halves so that a new bearing could be installed? 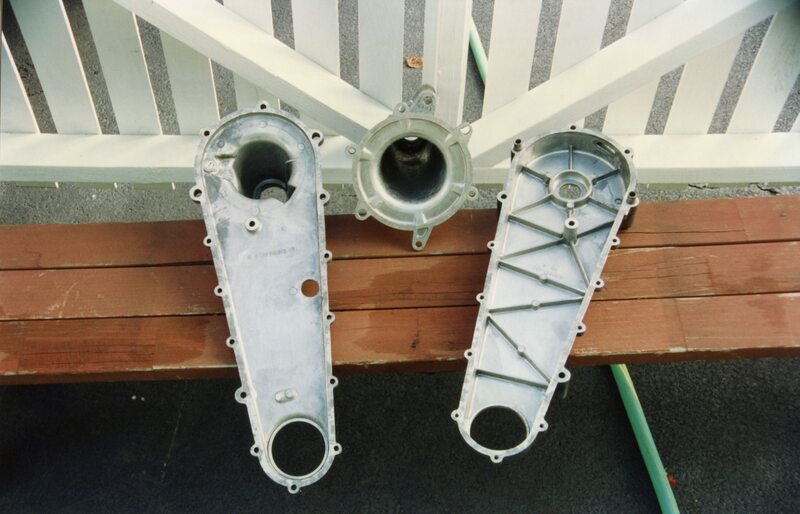 The 3 bare crankcases. 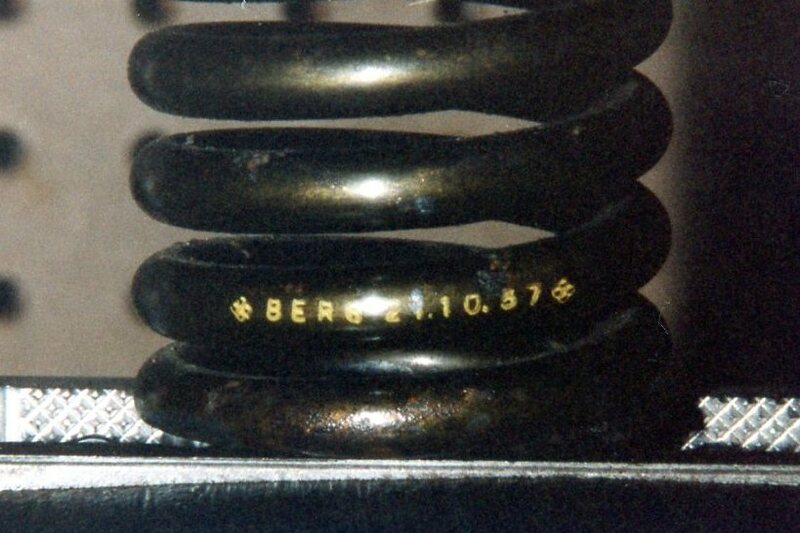 None showed any sign of wear or damage. 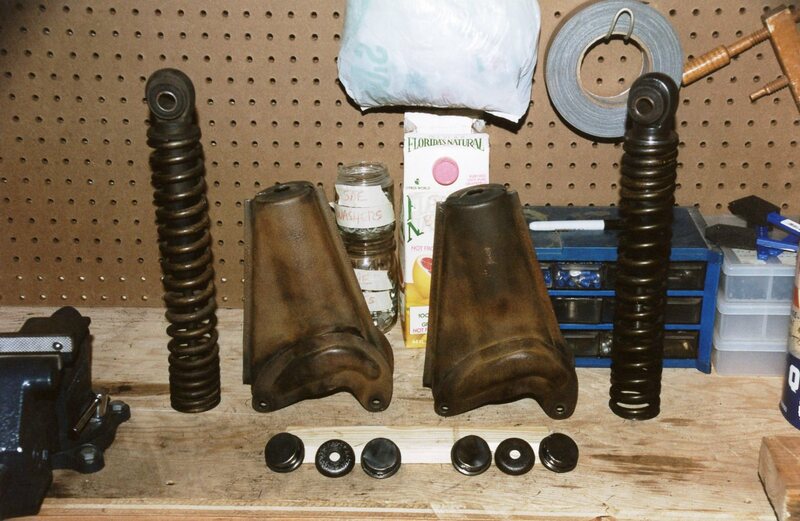 RR: Hi, I’m calling to find out if you can rebuild Isetta engine crankshafts. 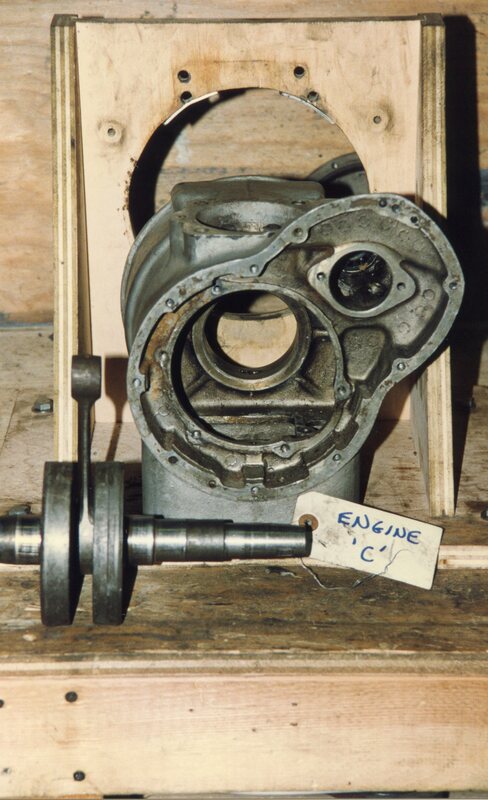 RK: Sure, just bring me the engine so I can remove the crankshaft and examine it. 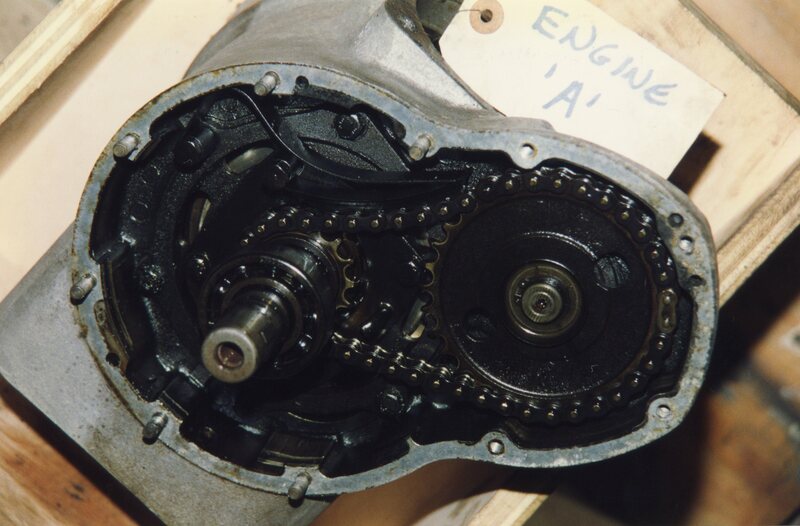 RR: Oh, the crank is already out of the case. RK: YOU are a genius. 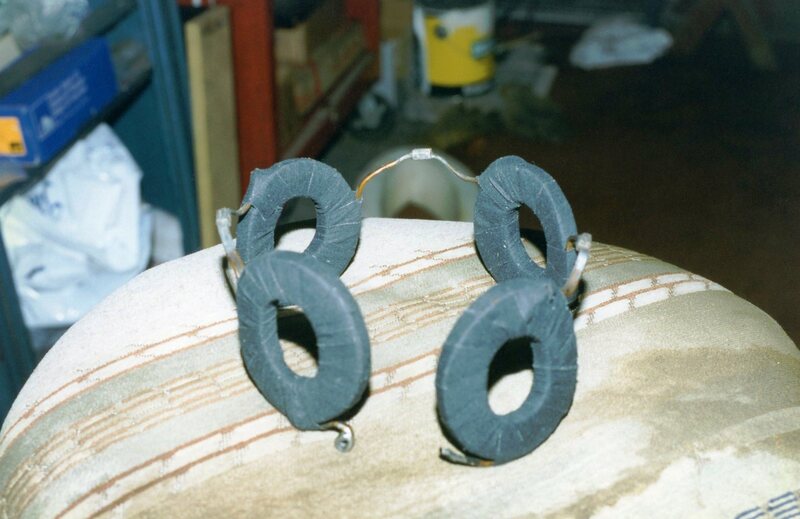 I tried to remain humble at this inference of my intelligence level (really, I was just a tech with a blowtorch). 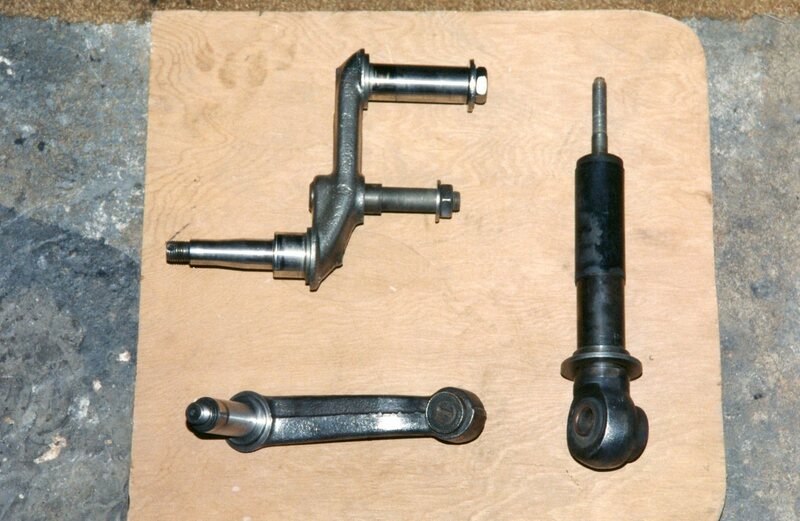 But Ron was OK with me bringing the crank/conrod assembly to him. We agreed that I could drive out on a Saturday morning to drop it off. 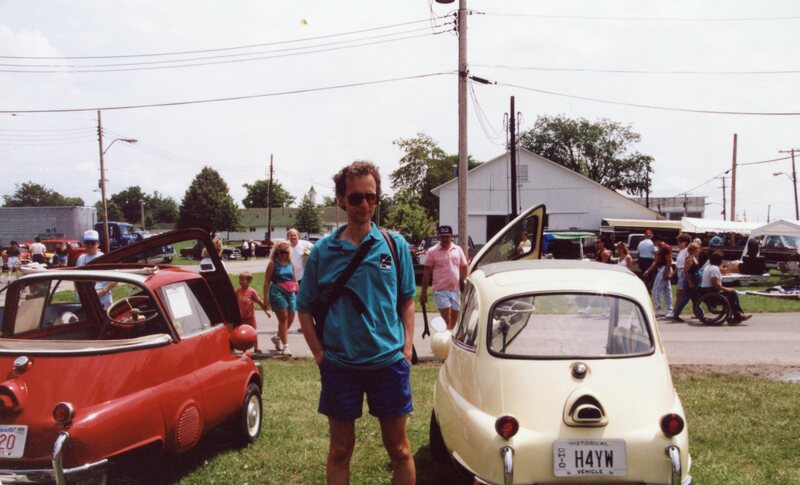 The following weekend, I arrived in Emmaus in front of what looked like an Isetta new car dealership. Out front, there was a glass-walled showroom with several restored Isettas. 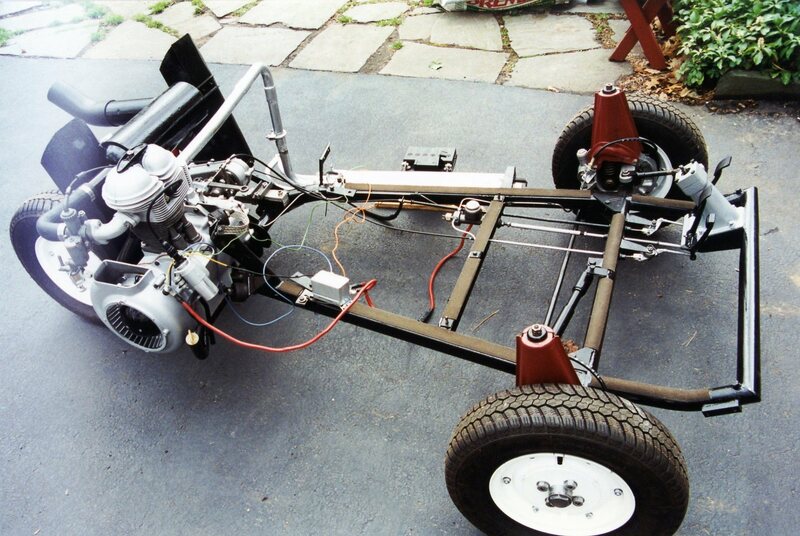 Inside was a service area with cars-in-progress, along with several chassis. Ron himself was behind a parts counter, assisting a customer ahead of me. It was 1957 all over again. 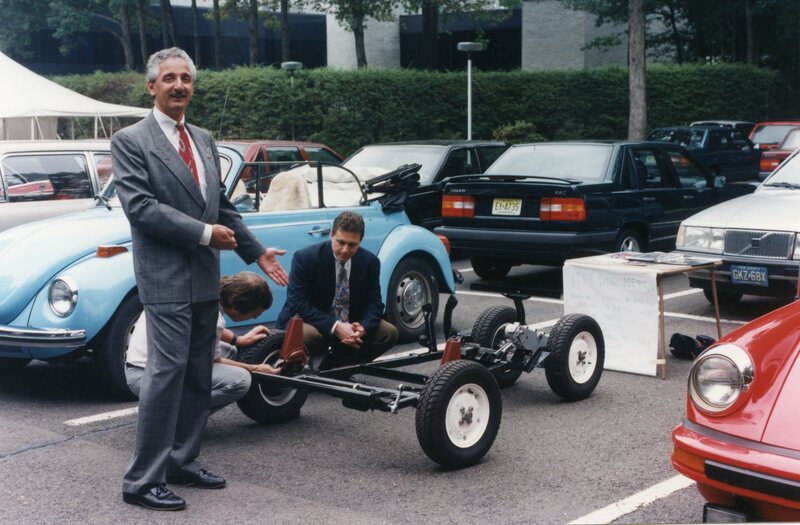 Ron Krause had been a successful Honda dealer principal. 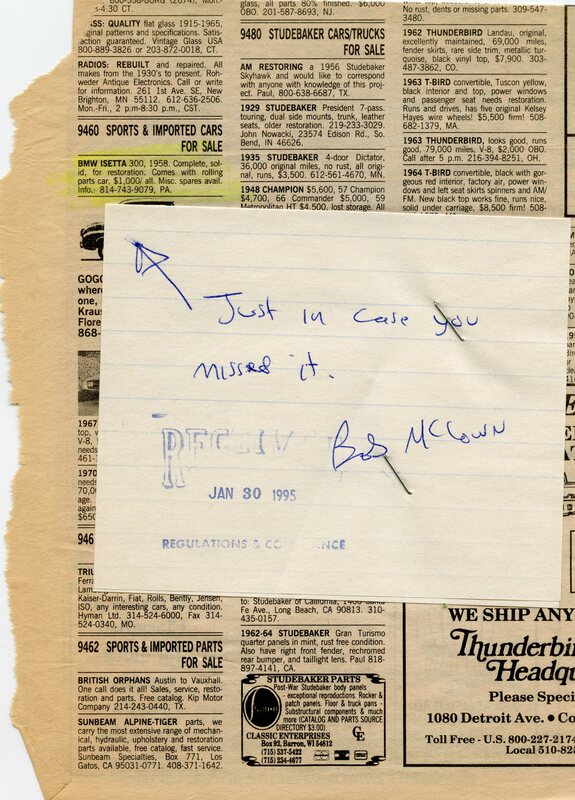 As I understood it, he got into Hondas very early in the game, sometime in the early ‘70s. He prospered through all the boom years, and then decided to retire. He sold the franchise, and the new owners had to relocate when he retained ownership of the property. 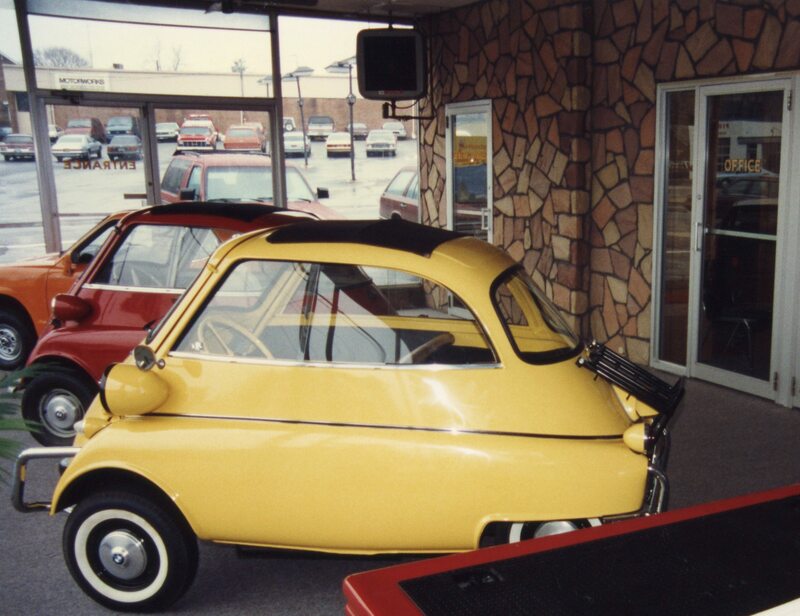 He kept the building where his Honda dealer was, and turned his hobby into an Isetta business. Here was yet another “character”, as seemed to be the trend among people who liked Isettas (not sure what that said about me). 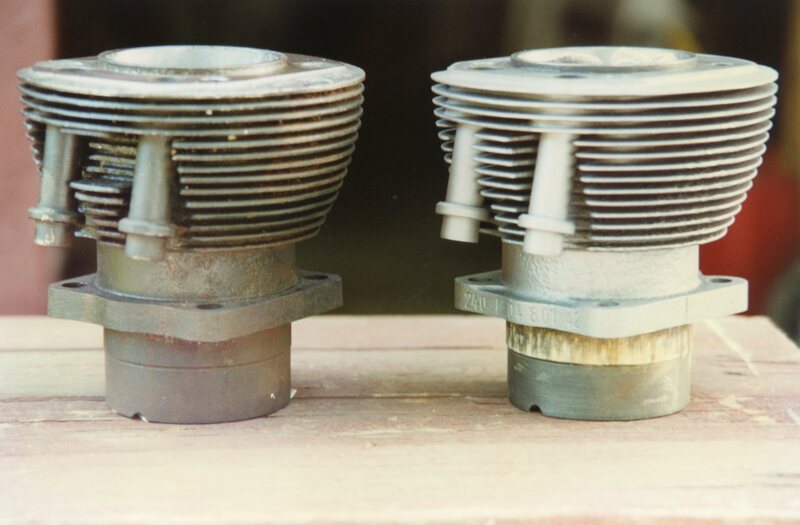 I had time to wander around while waiting for him to finish with his customer, and I couldn’t help but observe that as nice as his restorations were, they were not done to 100% original standards. 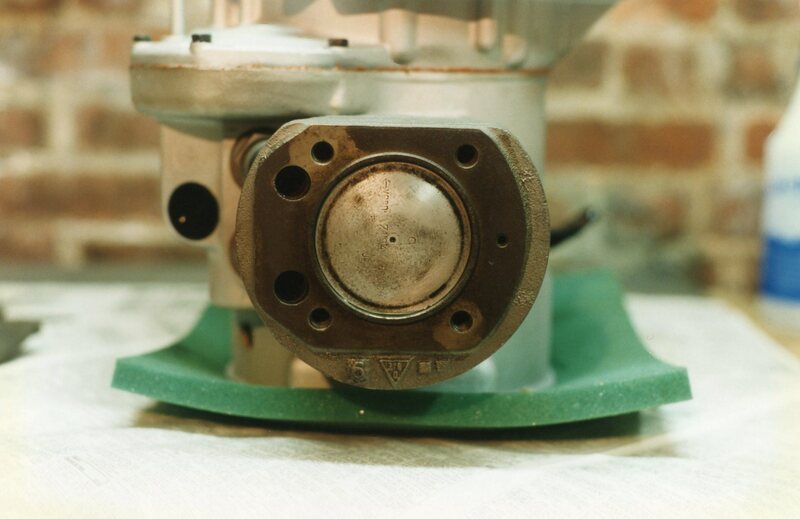 There’s nothing wrong with that if that’s what you want, but many of these restorations were not my preference. He especially favored inauthentic colors. 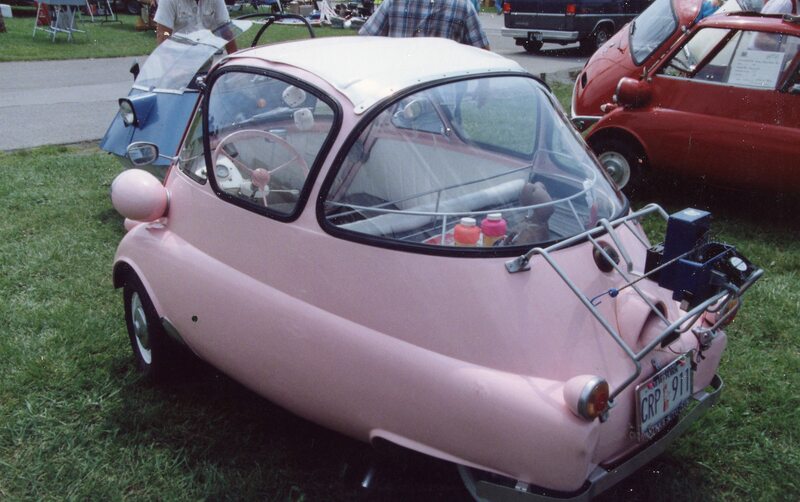 A rare bubble-window convertible was a quality job except for its metallic turquoise paint. 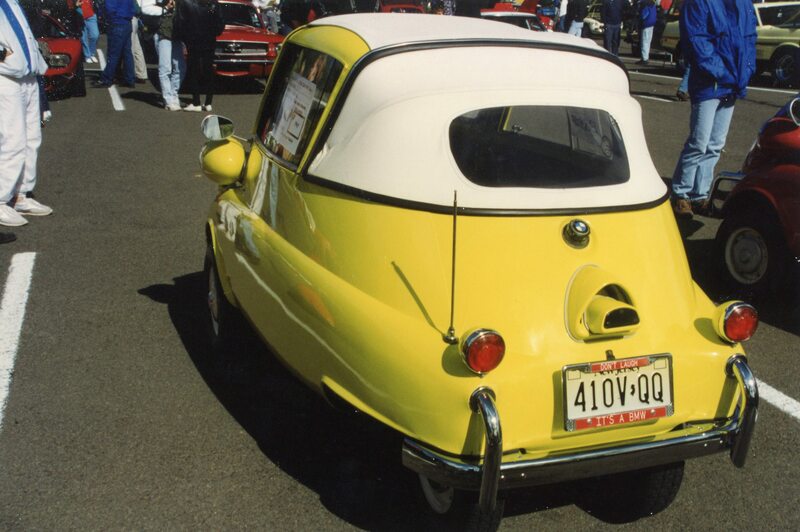 Not quite as bad was the white sliding-window convertible with blue body accents. 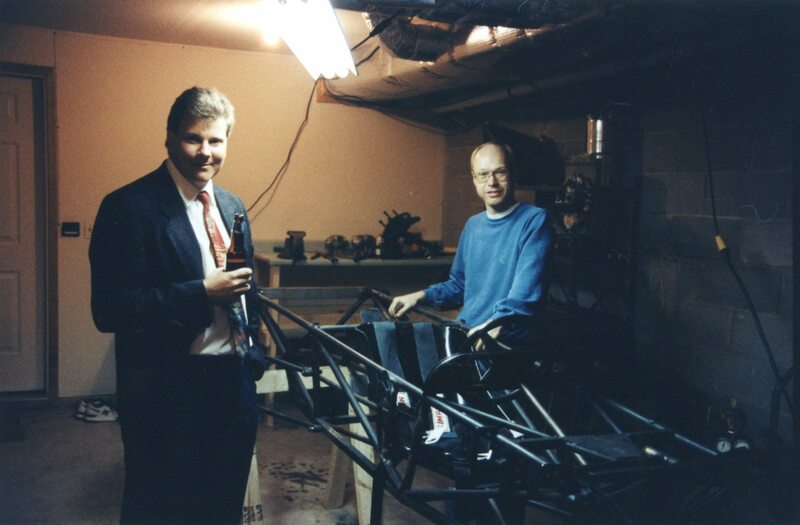 When Ron finally came out from behind the counter to greet me, he also went back to work on one of the chassis. 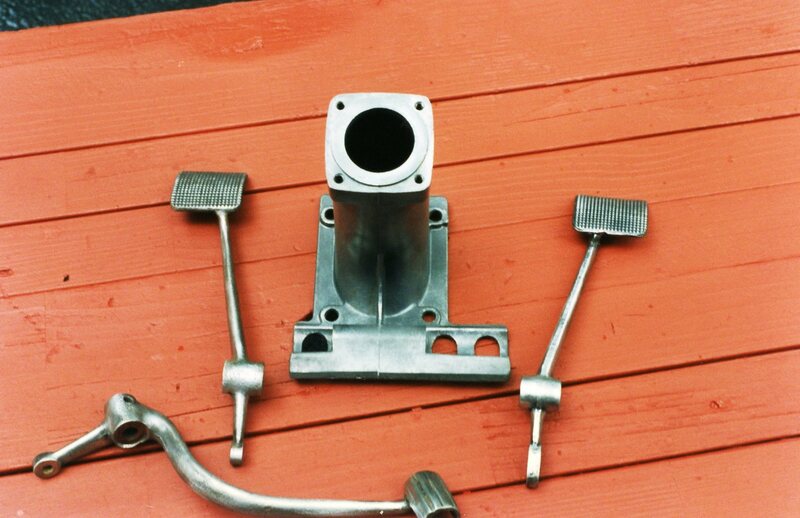 While we talked, he cut an intake manifold in half so that the two halves could be re-welded with one end rotated 90 degrees. 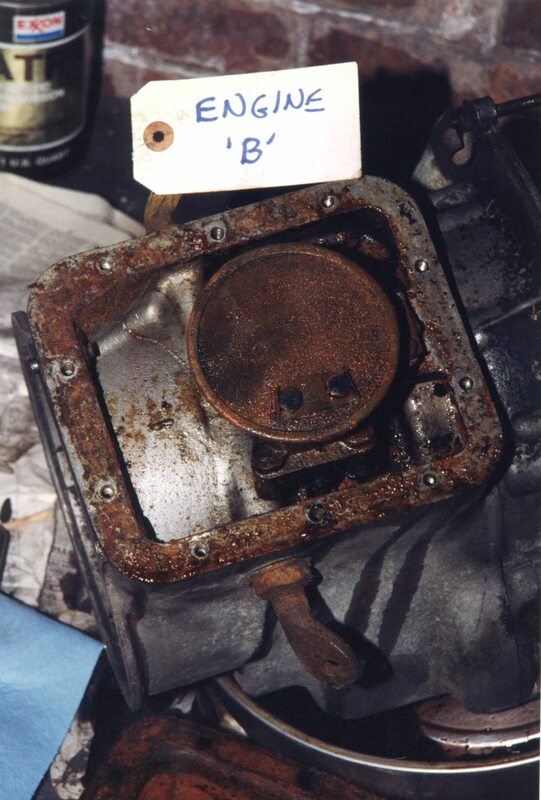 Ron made no secret of the fact that he “hated” the factory Bing carburetors. 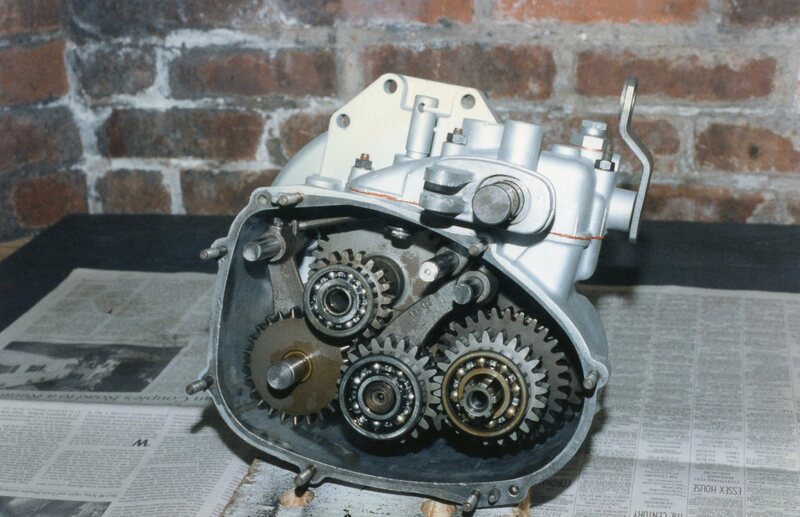 No doubt driven by his long-term Japanese car experience, he said he converted ALL his Isettas to run on Hitachi carbs. 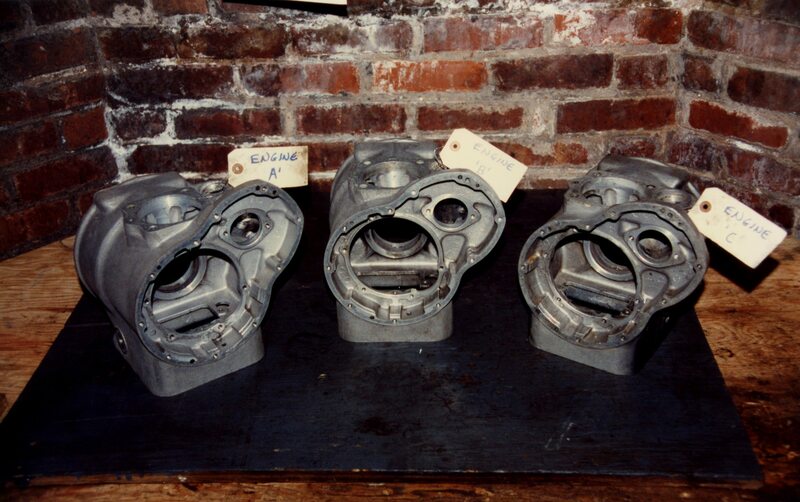 The reconfiguring of the intake manifolds was all it took for the Hitachis to bolt right up, at least according to Ron. 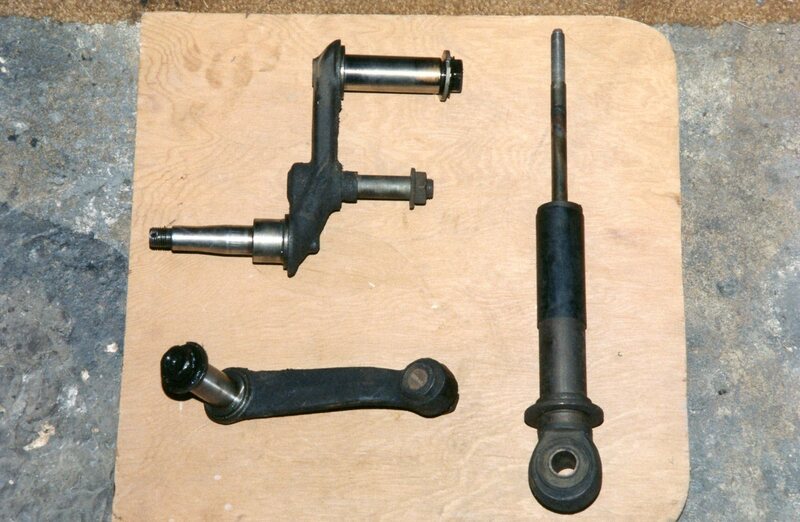 He agreed to rebuild the crankshaft and con rod assembly for me, so I left it with him, but not before inquiring about other parts he might have. 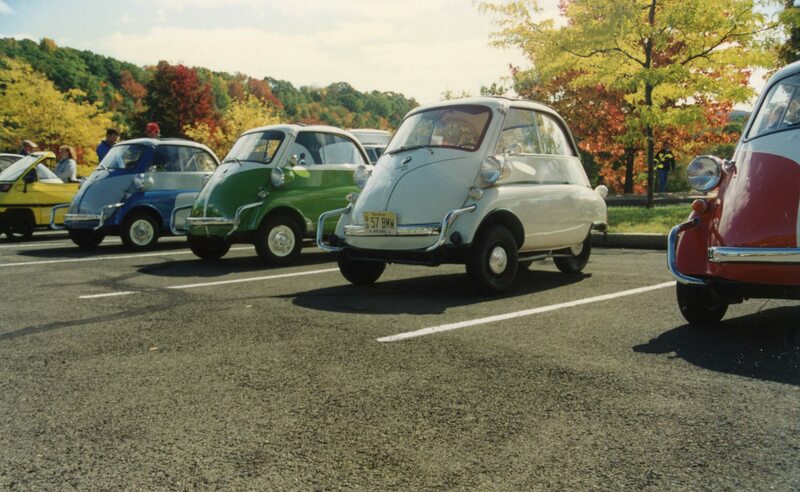 It felt like quite the stroke of good luck to have several sources of Isetta parts (first Isetta Johns in Rutherford NJ, and now Ron Krause) within an hour’s drive of me. 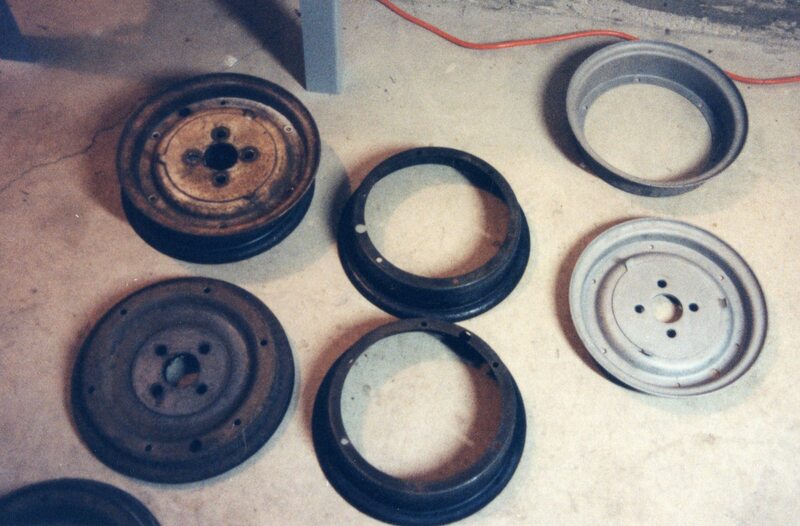 Things were looking up in my quest to get this project on the road by 1995. 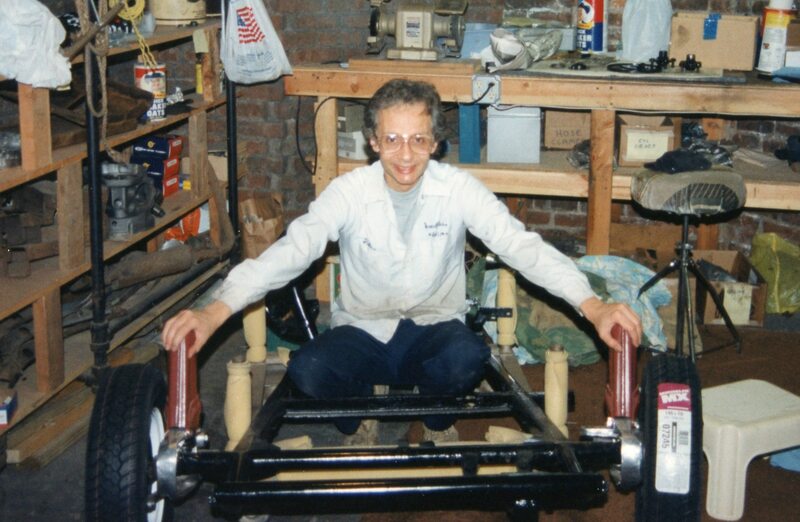 Chapter 8 of the Isetta Saga will detail progress on suspension, wheels, and tires happening while we patiently wait for the Krause crank creations (moan). Today we take for granted that the Japanese “Big 3” in the automotive world are Toyota, Nissan, and Honda. 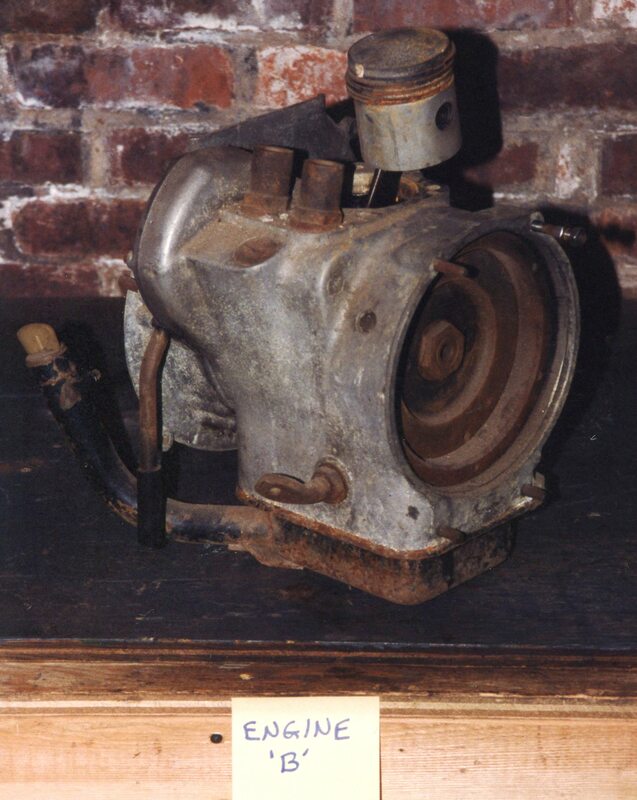 Toyota built its first passenger vehicle in 1935; Nissan was building cars under the Datsun name around the same time. 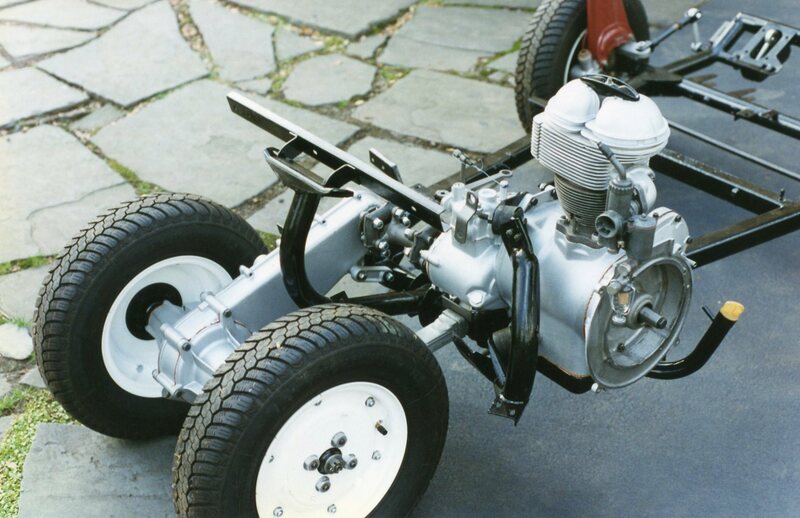 But Honda started much later: its first vehicles went on sale in 1963. While it entered the U.S. market in the late ‘60s with some quirky small cars, its first mainstream success was the introduction of the Civic in 1973, which stood out as one of the few front wheel drive vehicles available in any segment. The Accord was introduced in 1976. Both the Civic and Accord have been in continuous production since their introductions in the ‘70s. 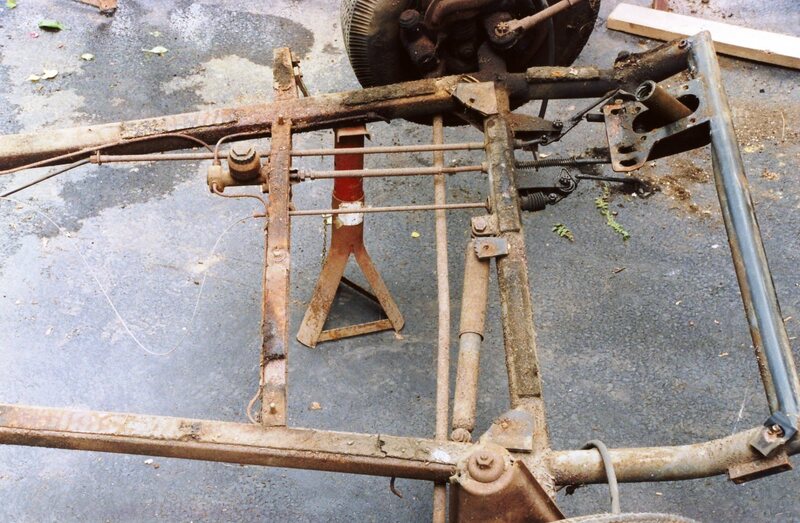 The Isetta Saga, Chapter 6: Strip That Chassis! 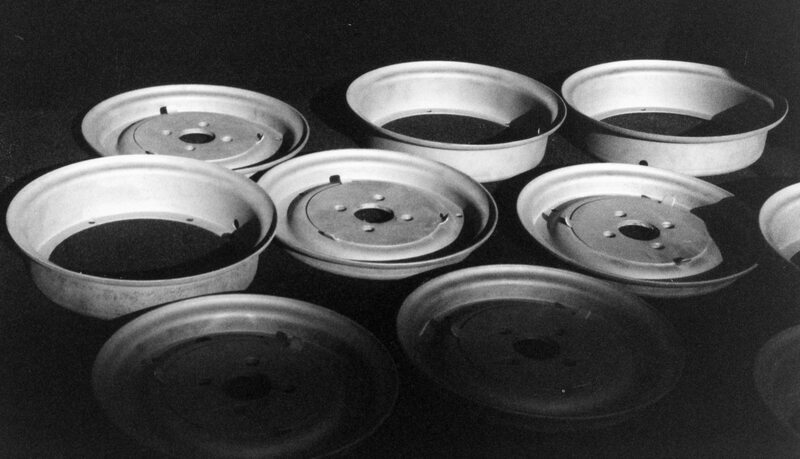 In Chapter 5, we counted down as the number of Isettas to be restored dwindled from three, to two, to one. Whew! That looks more manageable now. 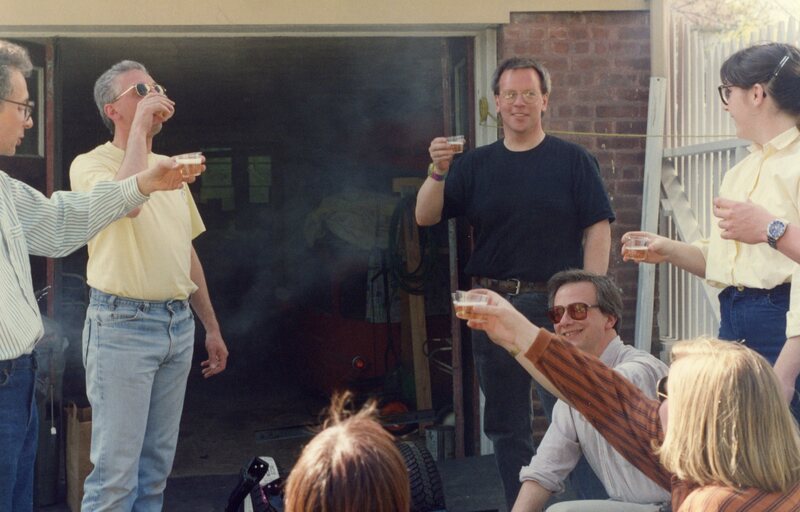 In Chapter 6 below, we finally get our hands dirty, and perform the first work of any substance on what will some day be a driving automobile. 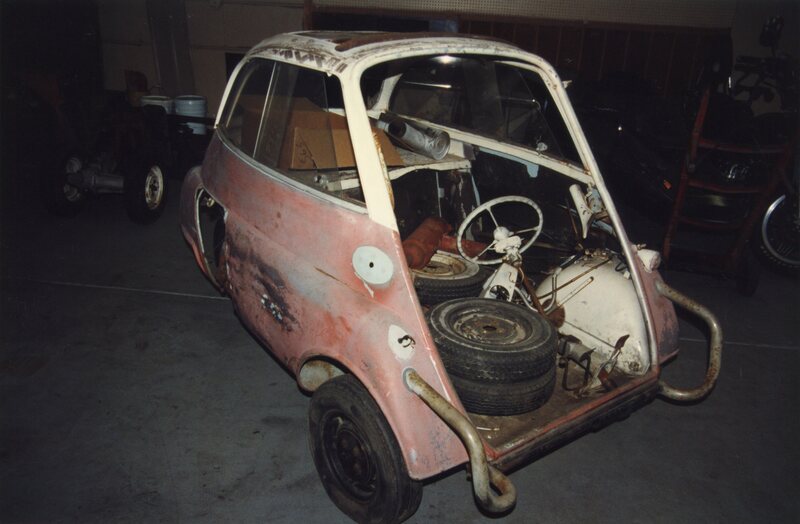 The Restoration Plan for what would eventually be ONE running and driving Isetta was coming more into focus. 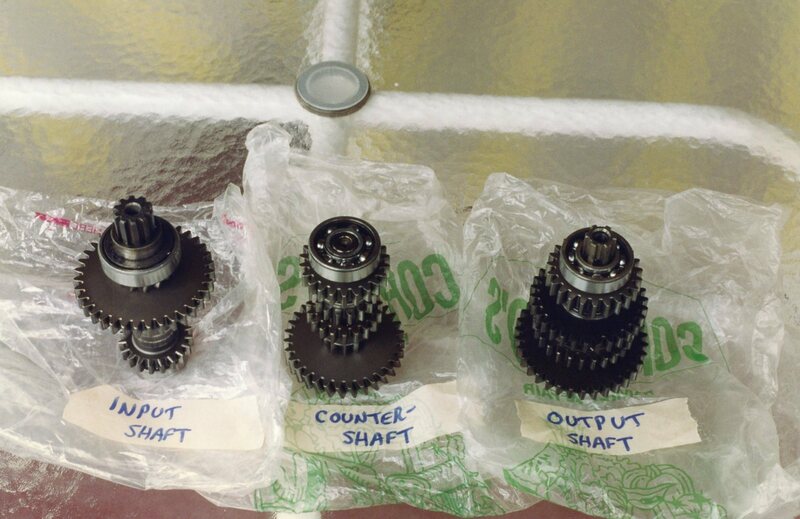 Some extraneous parts had been sold off, and remaining parts had been picked through and sorted, a more time-consuming process than first imagined. 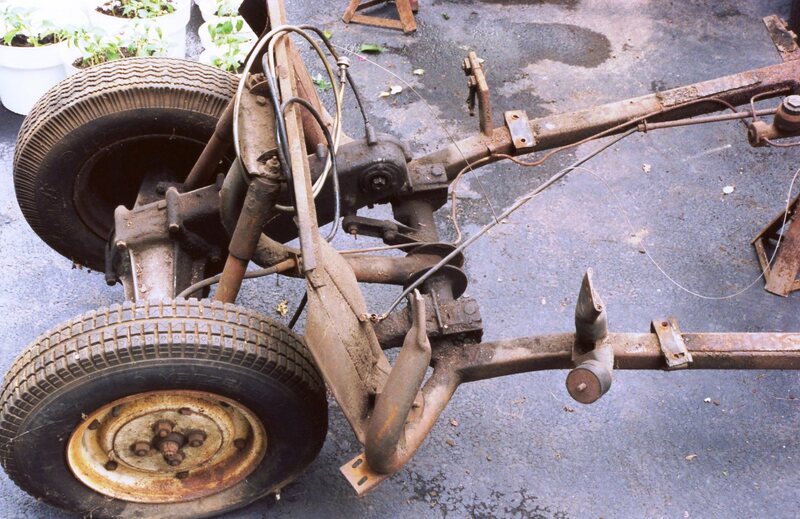 My gaze now turned to a rusty, crusty, but complete chassis, and the next course of action would be to remove everything from it, including its factory paint. But first, let’s shoot a roll of film! 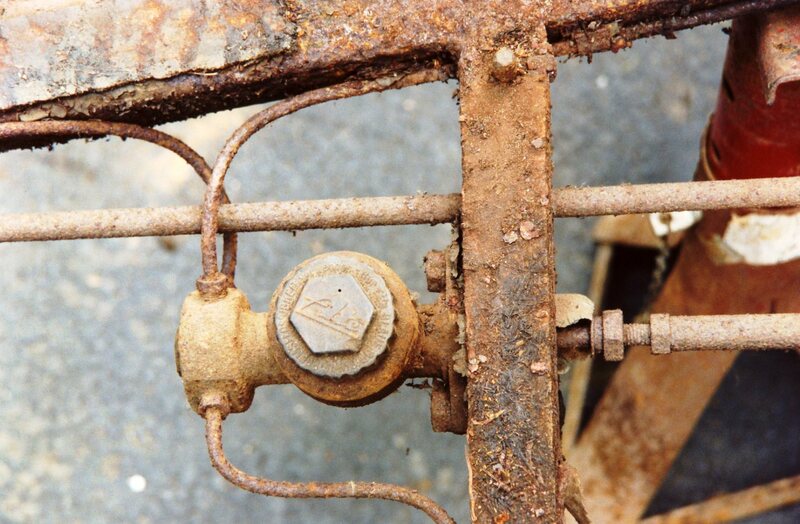 There was nothing to indicate that any major mechanical work had preceded my ownership of this fine German automobile, so the photographic evidence would provide documentation as to how the brake lines, suspension, foot controls, cables, etc. 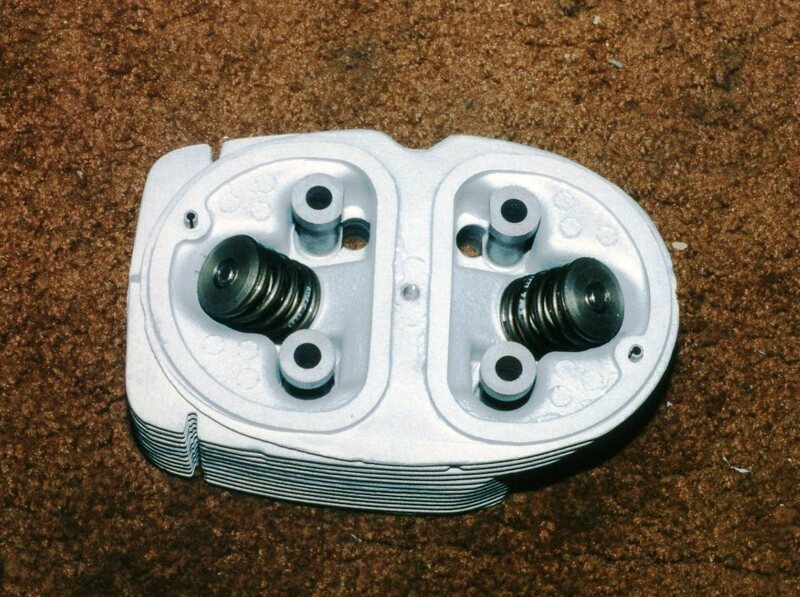 were installed by the factory. 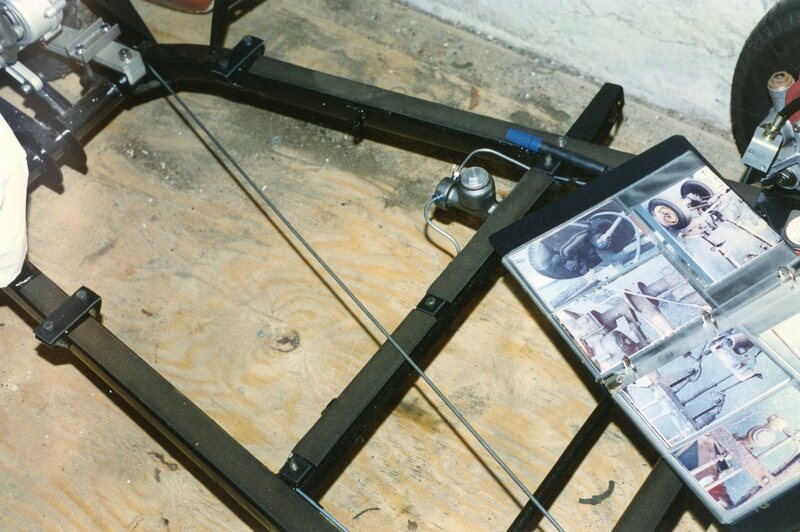 Once the photos were in hand, the chassis was stripped of all mechanical components, and all removed parts were labeled, bagged or boxed, and stored. 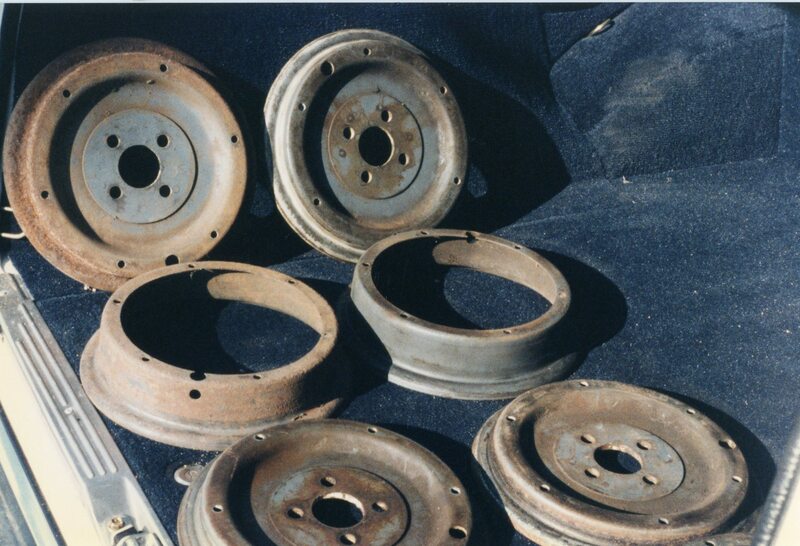 The only untouched parts were the front spindles. 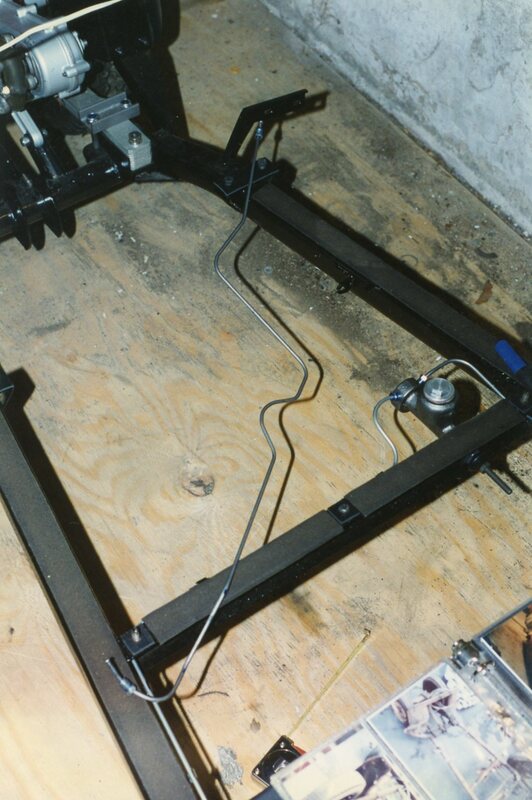 They were attached to the chassis via king pins. 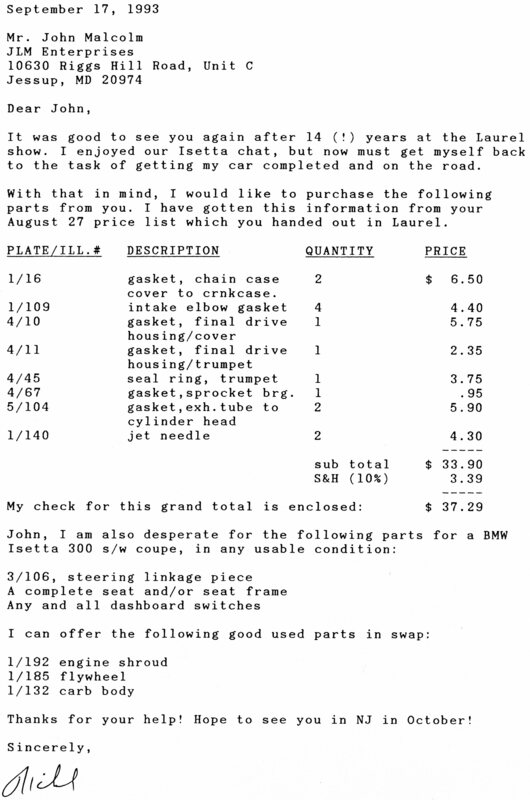 None of my Isetta parts catalogs showed replacement parts for them, and since I detected no freeplay, I let them be. 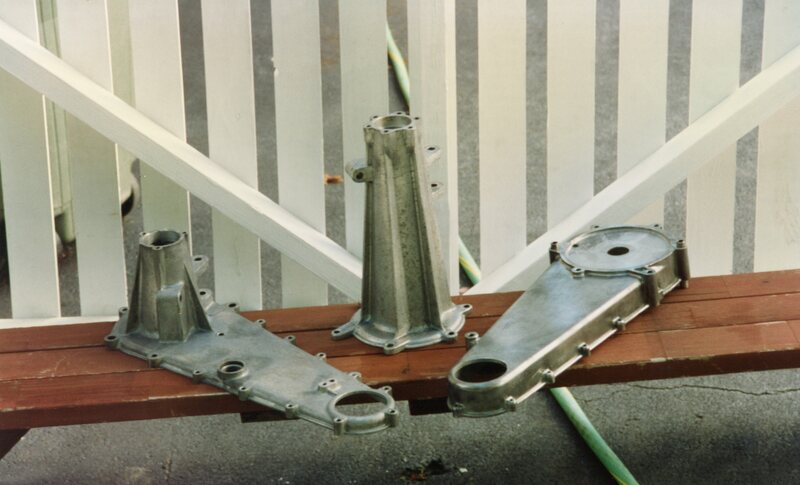 They were a beautiful cast aluminum, and would not require painting. 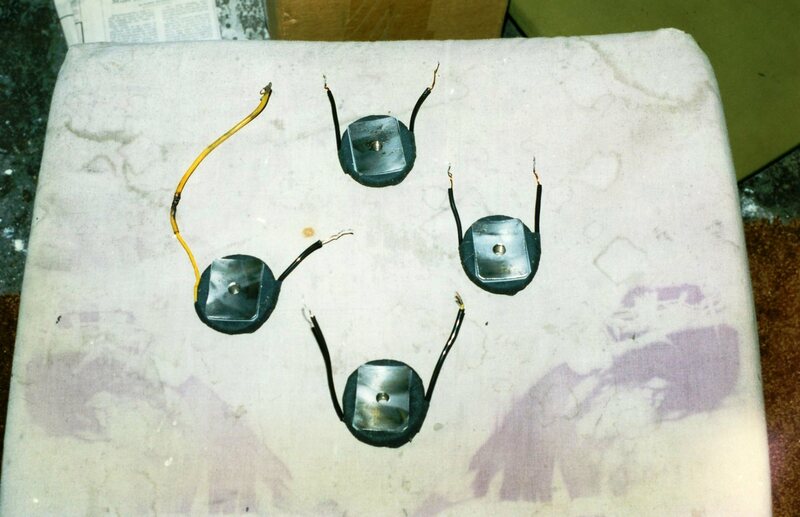 They would be masked for protection when the chassis was painted. 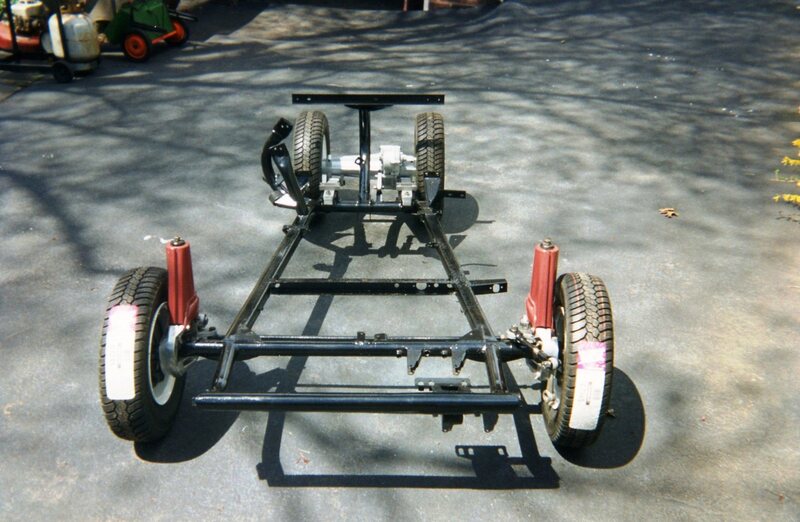 When stood on its end, the bare chassis was about as tall as I was, and weighed perhaps 40-50 pounds. 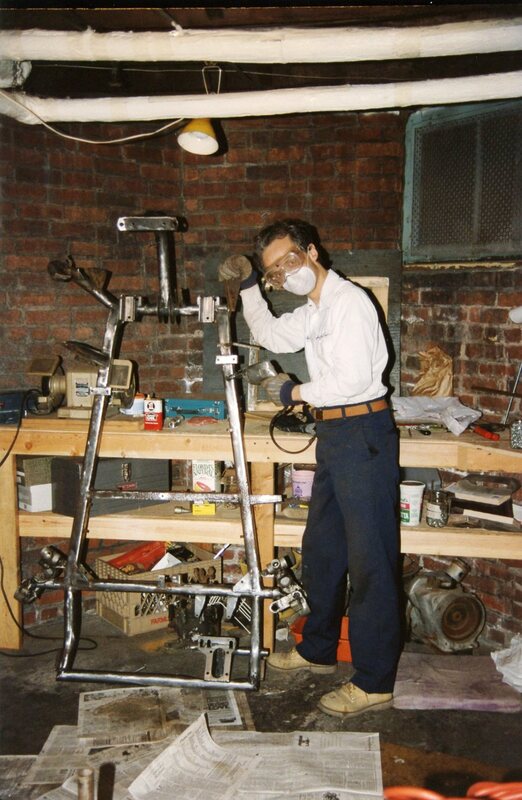 It was a simple affair to lift and carry it into my basement shop, a more comfortable place to work compared to the garage. 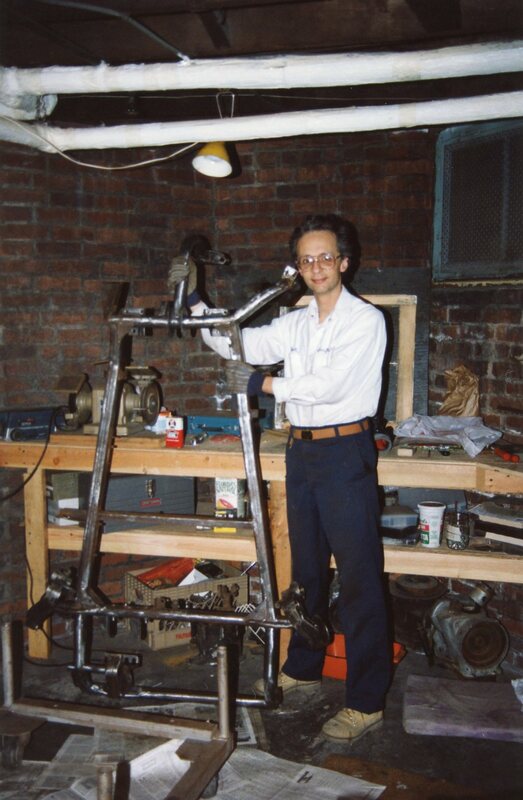 I set the chassis down onto an all-metal dolly that I found in a trash heap on a Brooklyn street corner while on a music gig. 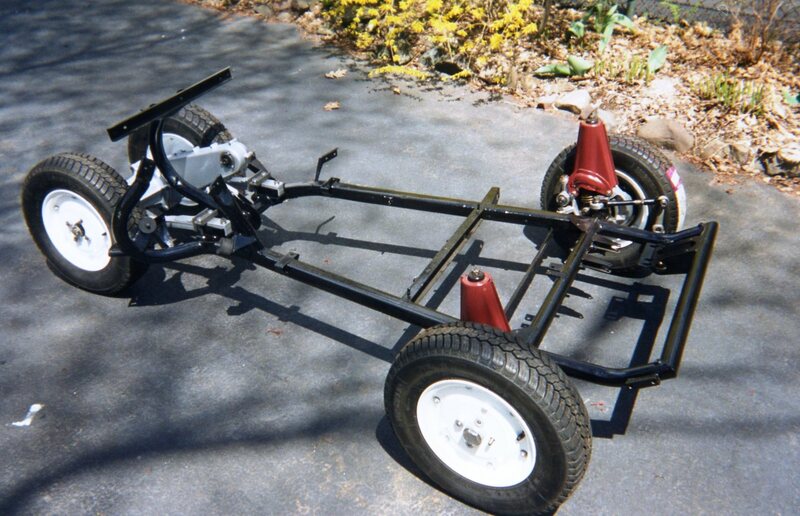 The dolly came home with me, jammed into the back of my wagon along with my drums. 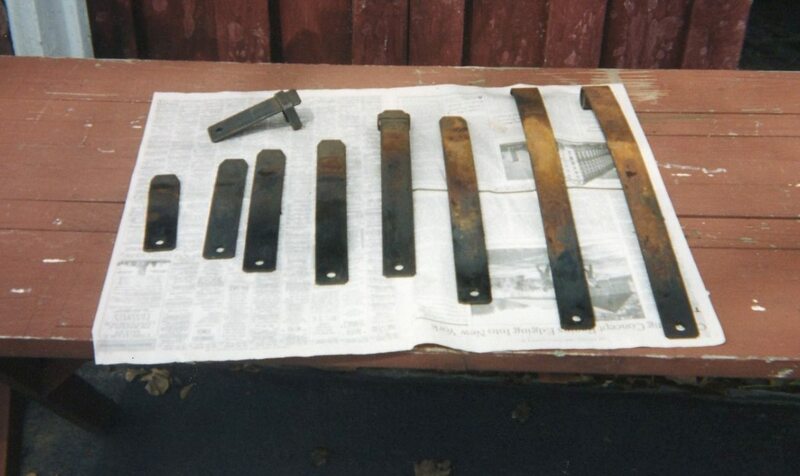 I tackled the old paint and rust with a 3M abrasive wheel, chucked into my handy Black & Decker all-metal drill. 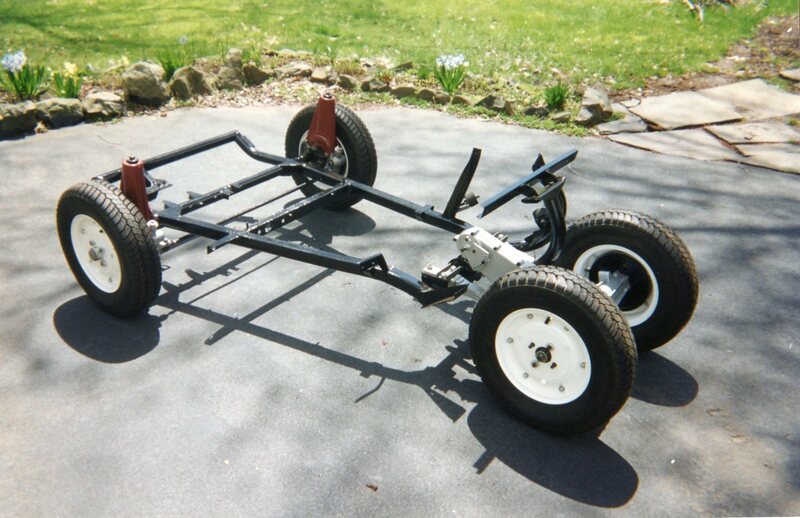 A short time later, the chassis was devoid of paint. 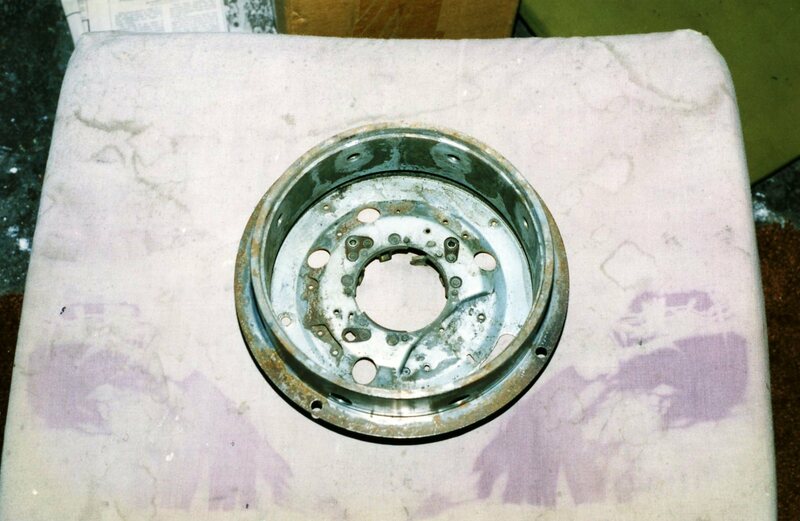 One could see welding splatter from the factory welds. 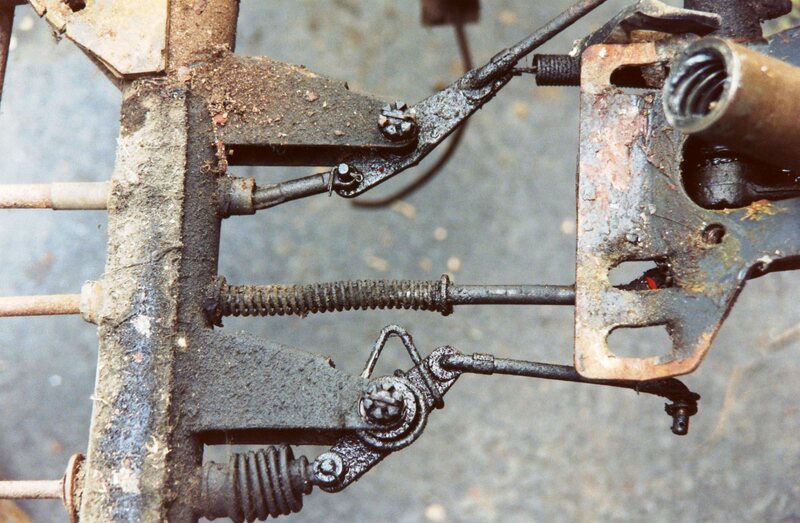 There were no signs of collision damage, nor had rust permeated the structure in any way. 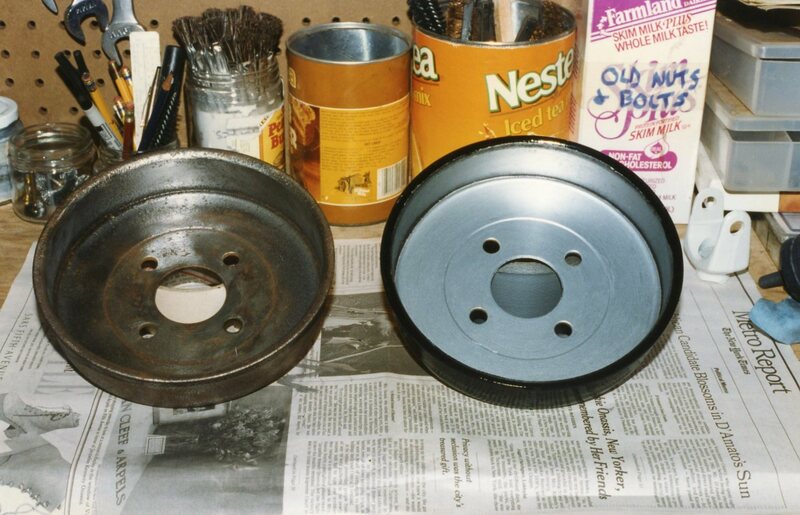 For paint, I settled on Bill Hirsch’s Miracle Paint, a product that was heavily advertised in collector car publications of the day. 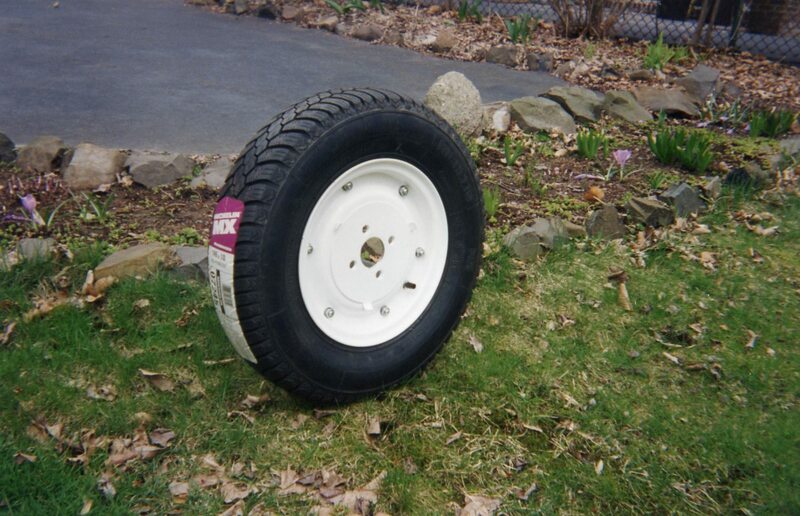 Compared to POR-15, Miracle Paint was promoted as not requiring a top coat (although one could paint on top of it if desired). Available in black, silver, and clear, I selected black, and when I saw how glossy it was, I decided that no top coat was needed. I learned the hard way that if you removed the lid on a can of Miracle Paint, got some paint in the can’s lip, and reinstalled the lid, that lid was not coming off again. 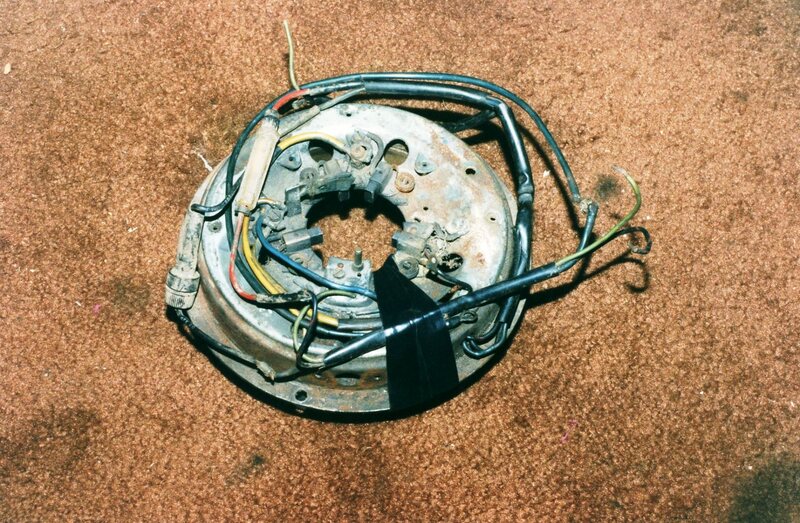 The “trick” was this: keep the lid on the can. Shake it well. Using an awl, punch two holes in the top (one slightly larger than the other). Pour out just enough paint as needed into a disposable cup (the 2nd hole allowed the paint to pour out more freely), and close both holes with duct tape. 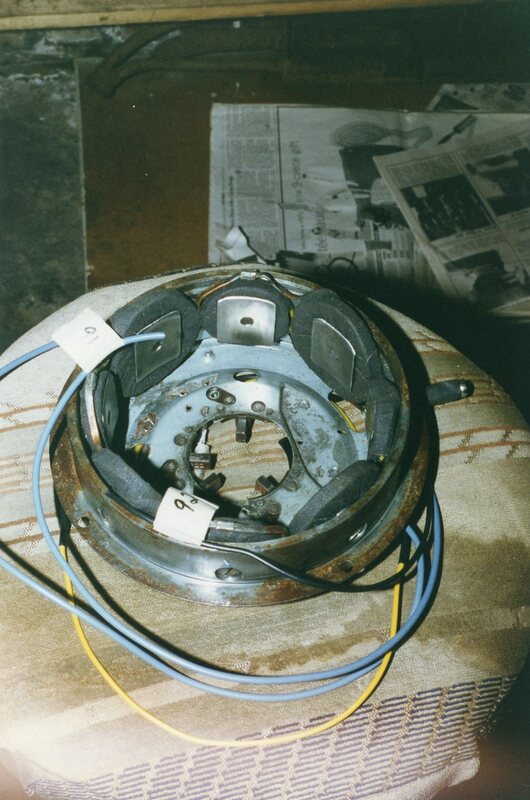 If the duct tape could not be removed, you only had to punch a hole through the tape, and into the existing hole. This worked like a charm. 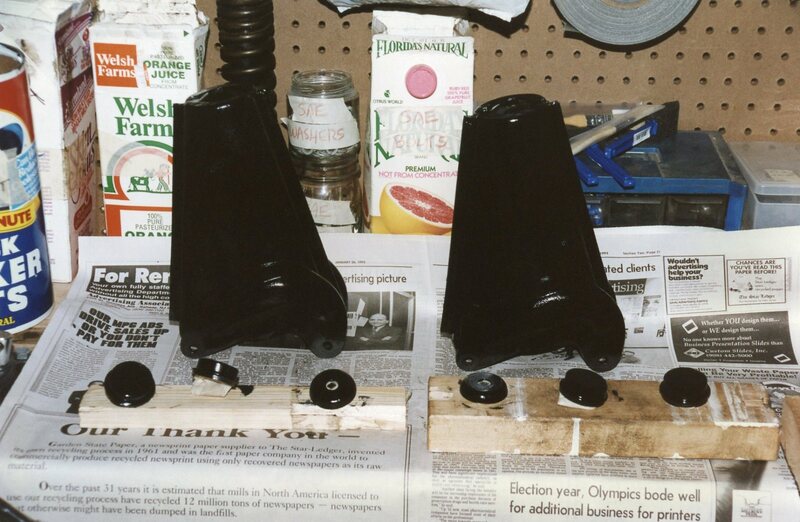 Although Bill Hirsch sold Miracle Paint solvent, I found it much more efficient to paint with disposable foam brushes. 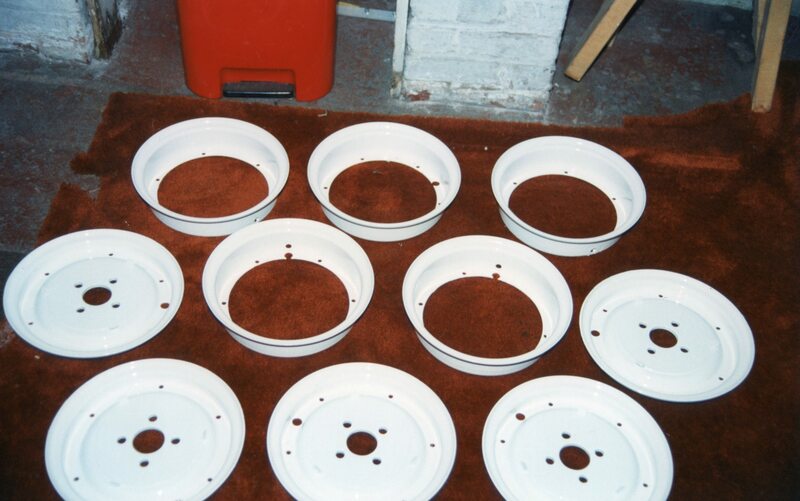 They could be bought at Carlisle for 25 cents each, and the foam left a smooth surface without brush marks. 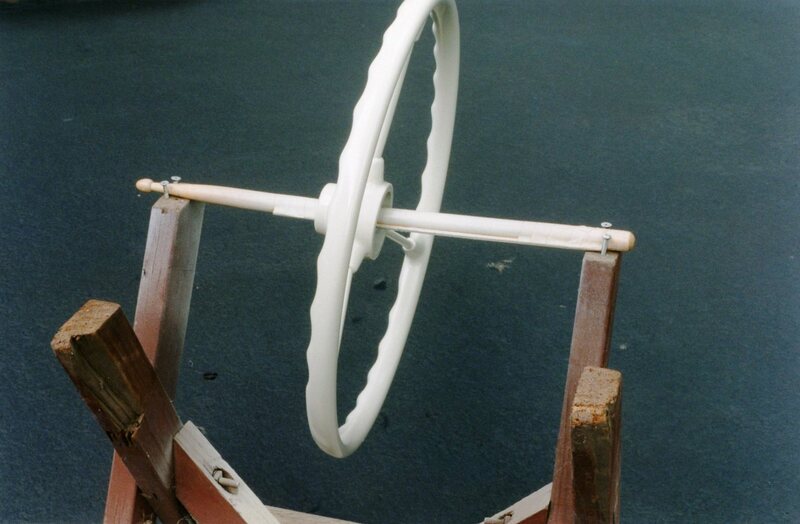 The entire chassis, indeed much of this project, was painted with foam brushes. By this time, we were halfway into 1992, and while progress was “steady”, it was also “slow”. 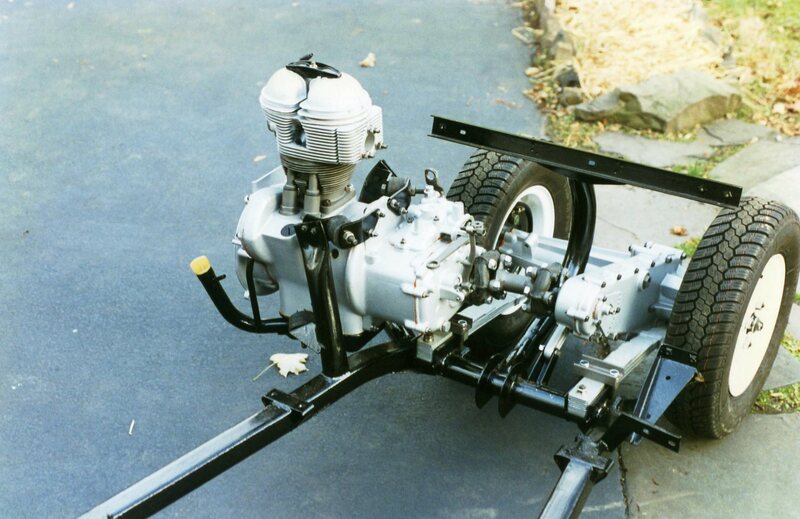 In these days, prior to TV shows which glamorized auto restoration, I’d read the occasional article in Old Cars Weekly about someone who restored a ’57 Chevy in six months. Sure! 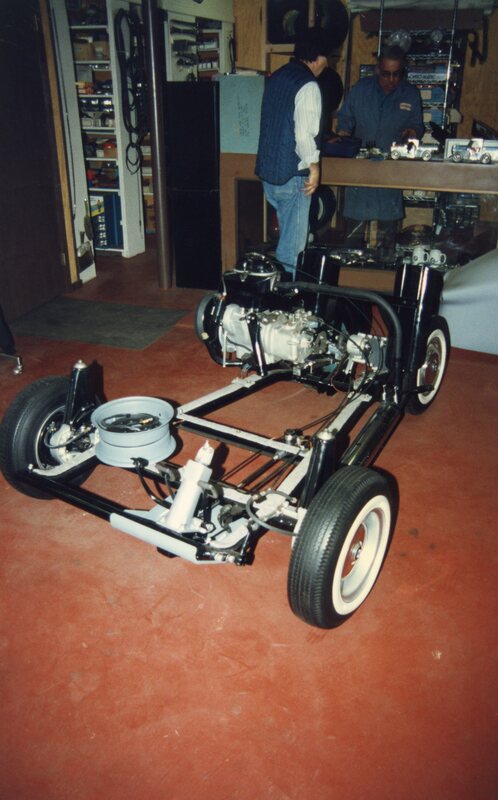 First, you had dozens of parts suppliers who had everything you needed; second, you could attend any car show and find a reference car, should you need to examine one; and third, you were probably retired, and had 40-50 hours a week to devote to the hobby. My path forward offered to none of these advantages. 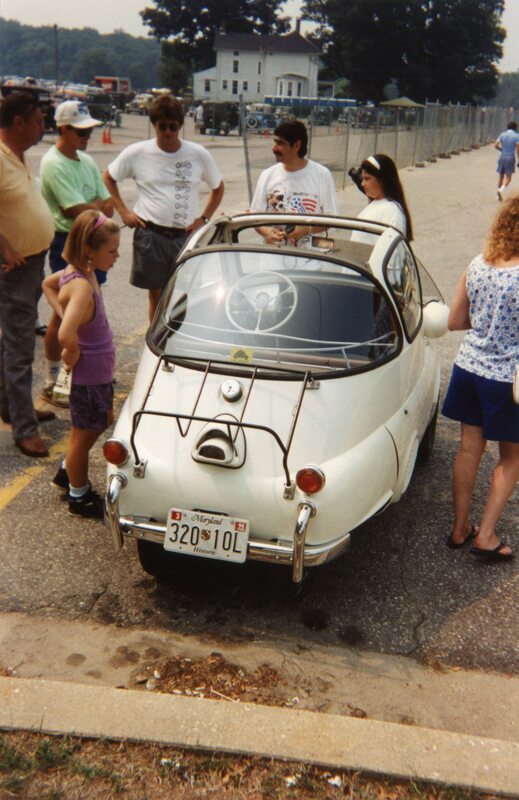 During the summer of 1992, I learned of a car show in eastern Ohio that was planning to feature BMW Isettas in a special class, so we went. Yes, it was a long ride to look at some Isettas, but the last time I had done something like this was ten years prior. 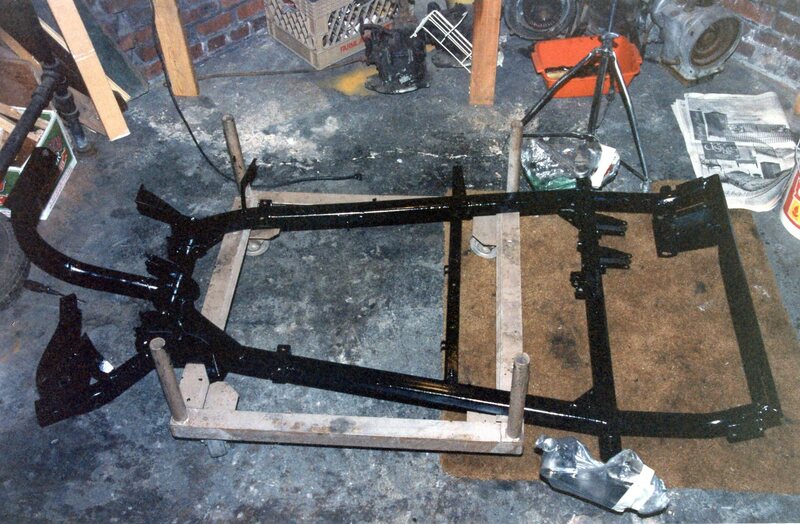 My restoration had begun, and I was anxious for the inspiration. We got to the show, and the turnout was better than expected. Looking much like dyed Easter eggs (and not much larger), the lineup of Isettas made for some striking photos. 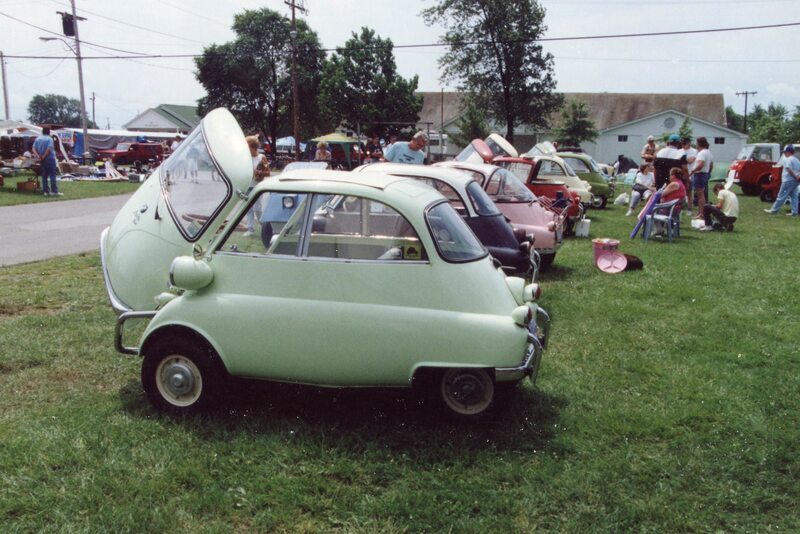 I chatted with a few owners, one of whom informed me of a new club, called the Microcar and Minicar Club. He provided me with an application, and encouraged me to join. But the biggest shock of the show was provided by someone who did not have a car on display. I watched as a man set up several display tables, and proceeded to unload crates and boxes of …. 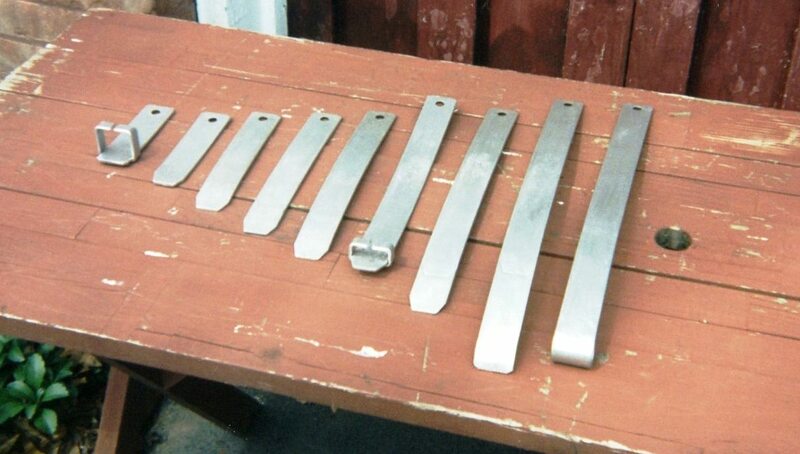 new Isetta parts. 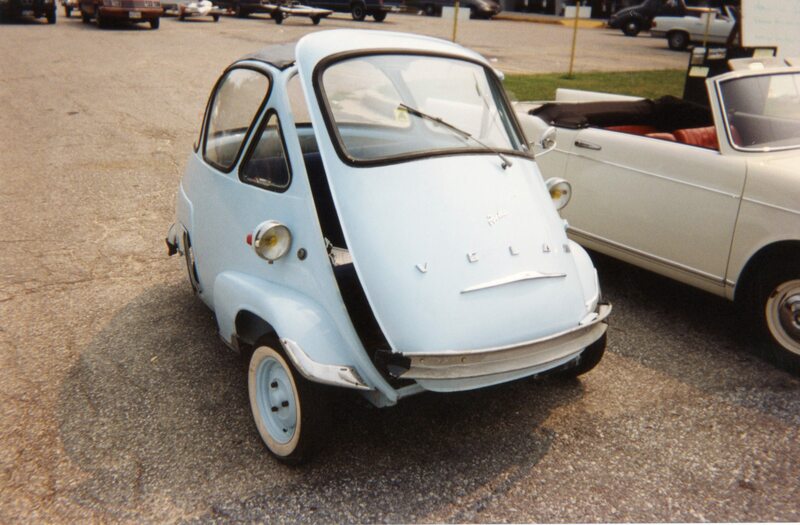 His name was John Wetzel, and he operated a business that he called Isetta Johns (sic). 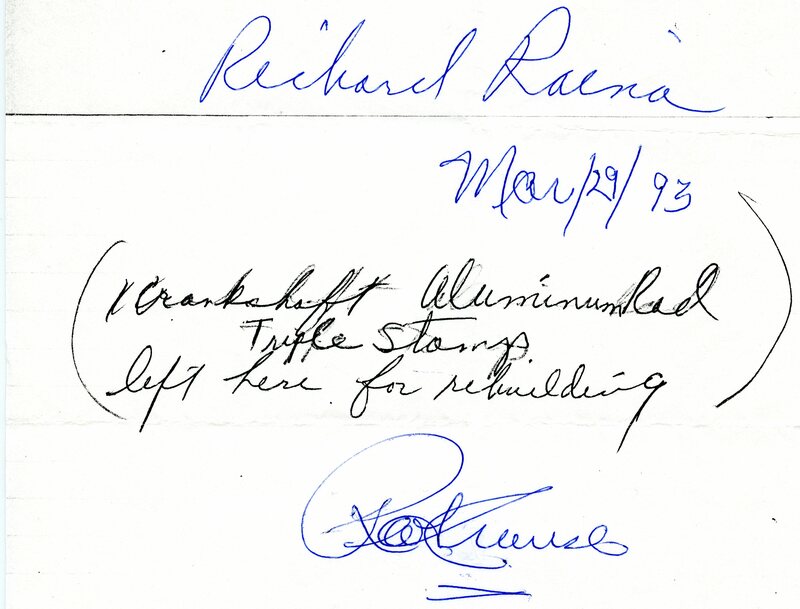 He lived in Rutherford NJ, most convenient for me, and by all appearances, this was his full-time employment. While I did not purchase from him that day, I obtained his contact information, and assured him that I would be in touch. My recollection of that show was that it left me feeling overwhelmed, and slightly depressed. I saw that I had a long way to go before my car would be up to the caliber of the cars in Ohio. 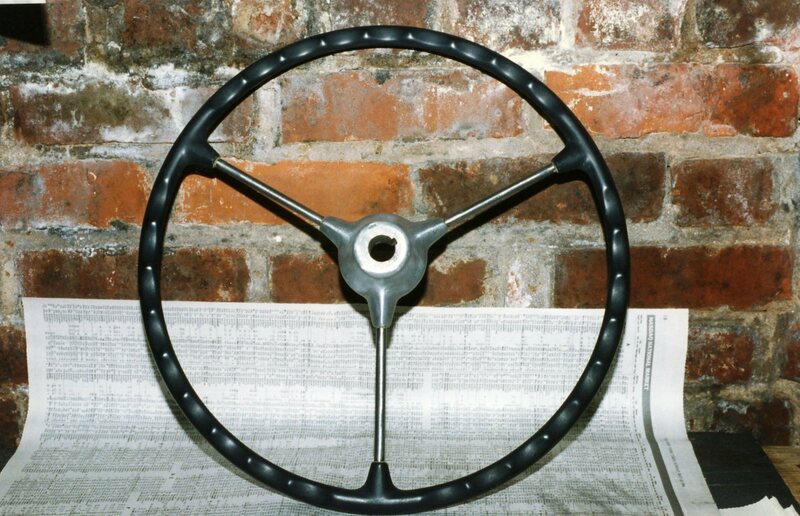 This, combined with the discovery of someone like Isetta Johns, also altered my thinking about the project. 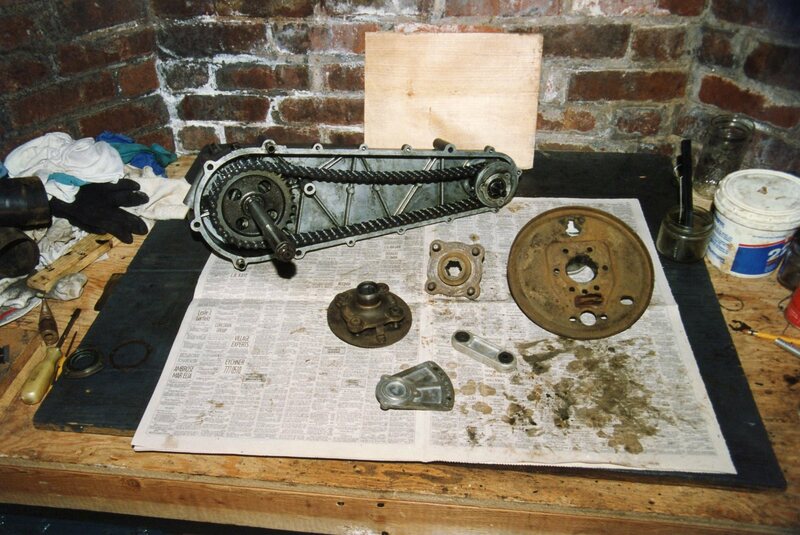 Rather than just get the car to run, only to possibly take it apart again to fully restore it, it seemed the wiser decision to perform a complete restoration while it was all in pieces. I needed to step up my game. 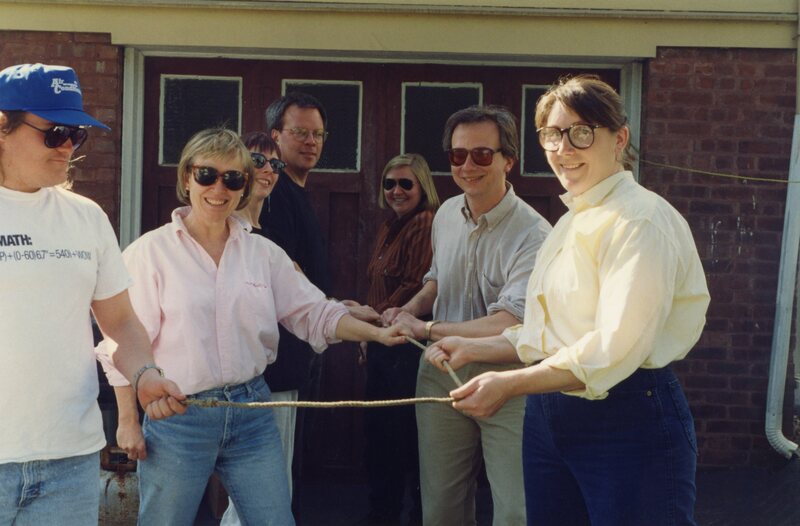 The business world in the early 1990s was as much about organization and motivation as it was about making profits. This certainly was the case at Volvo, what with newly launched efforts on Vision Statements, Mission Statements, Total Quality Management, and so on. Taking a page from this approach, I decided that a motivating slogan would spur me to keep pushing forward. For the umpteenth time, I asked myself, “this car is so small! How long could it take?” The approximate answer to that was “three more years”, which would land me in 1995. 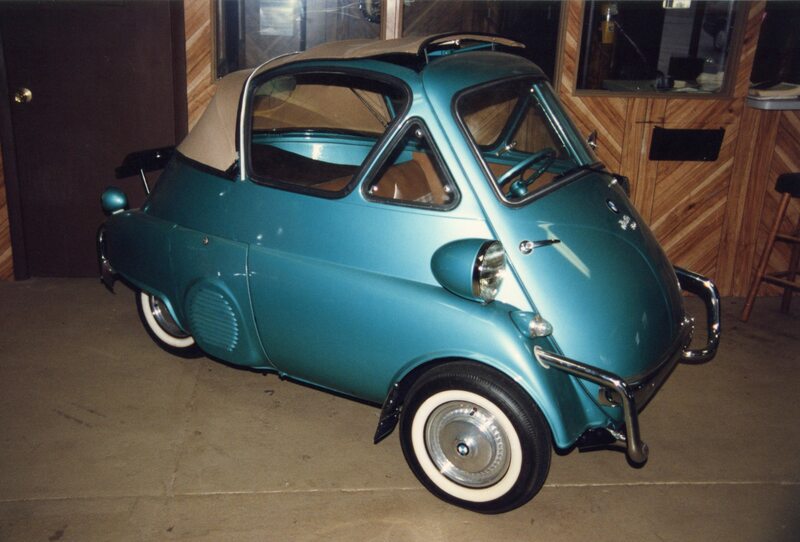 The slogan was born: “THE ISETTA WILL DRIVE IN ‘95”. I printed out multiple copies, and hung one in my workshop at home, and one in my office at work. Some of my Volvo colleagues took pity on me; others thought I had lost my mind. 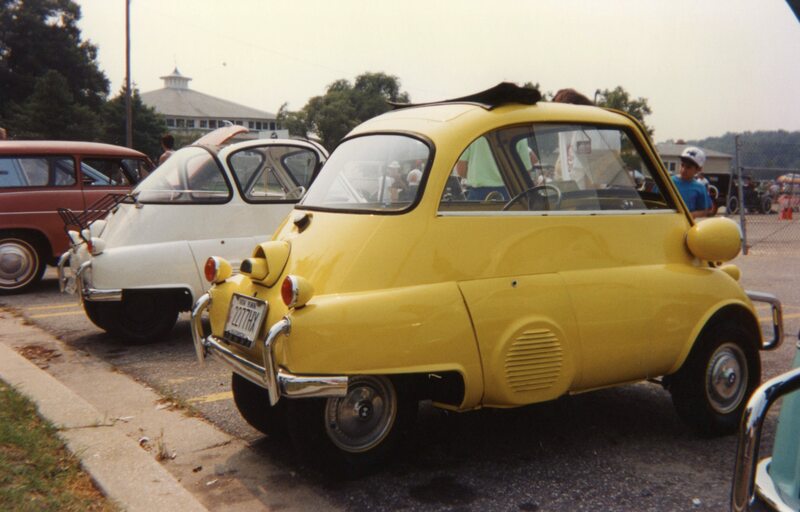 In Chapter 7 of the Isetta Saga, you’ll learn how the twin discoveries of an Isetta Restoration Book and an “Isetta Dealership” in Pennsylvania provided the kick start to a rebuild of the 1-cylinder BMW motorcycle engine. 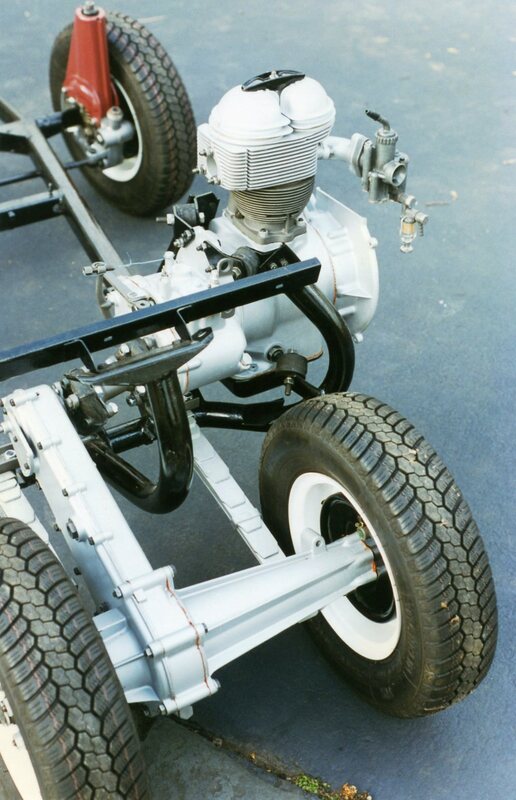 The word “chassis”(pronounced CHA-see) is actually French. Its etymology goes back to Latin, but in 13th century Old French, it was spelled “chassiz”, and defined as a “frame” or “framework”. 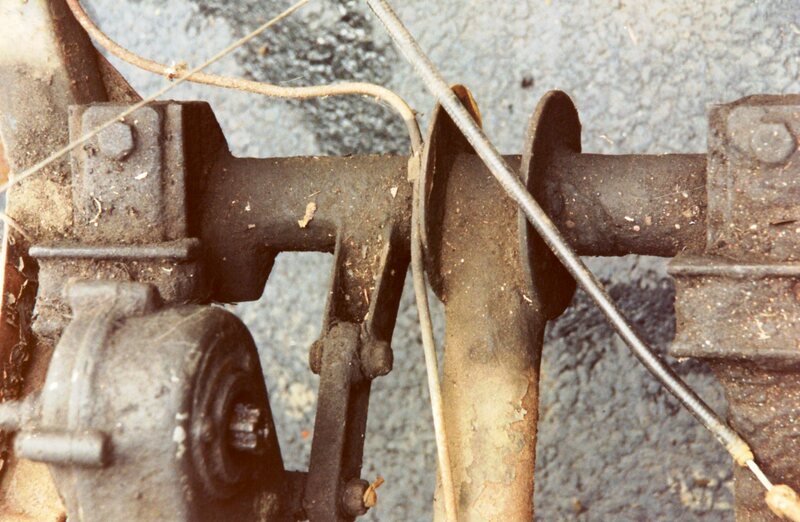 By the 1660s, the spelling evolved to “chassis”, and more narrowly referred to a “window frame”. In 1869, the word was defined as a “sliding frame or carriage base for a large gun” (I’m picturing something more akin to a cannon, rather than a hand-held gun). 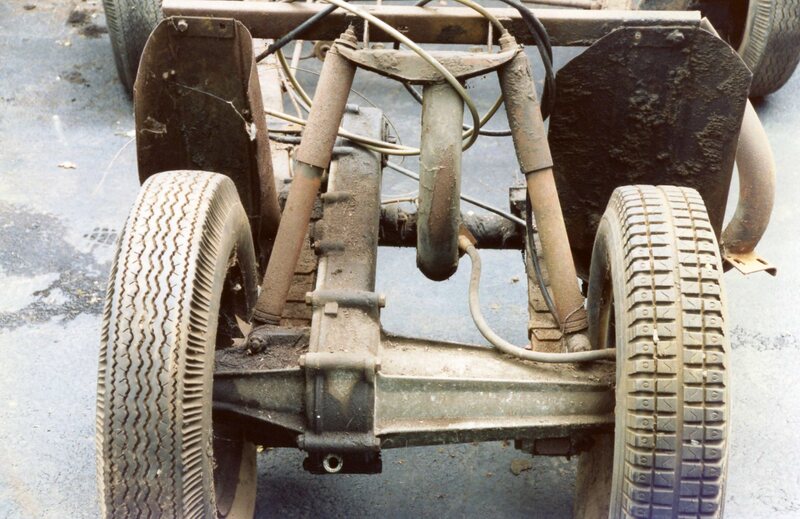 In 1903, at the start of the automotive industry, it entered the English language as meaning “the base frame of an automobile”. 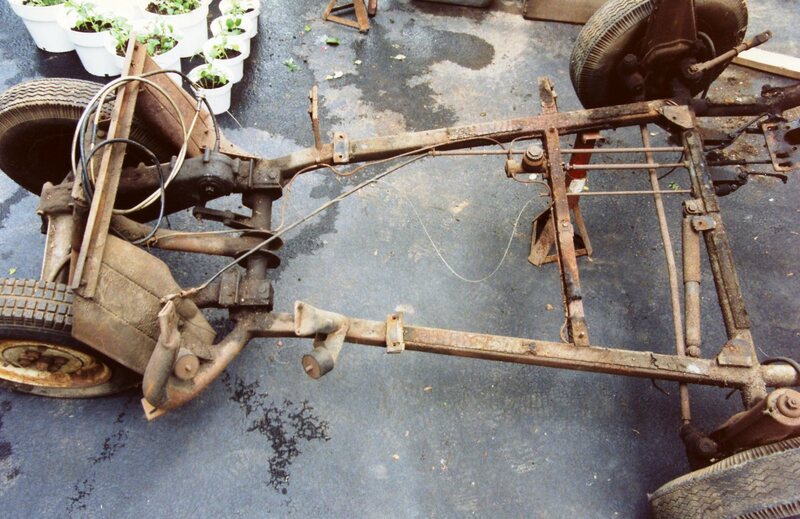 Although I could find no further explanation as to how the word switched from guns to cars, it seems logical that given the French dominance in the very early years of the horseless carriage, a French word for a car part would easily be adopted. After all, the word “automobile” also comes to us directly from the French. Remember this the next time you’re eating French Fries.